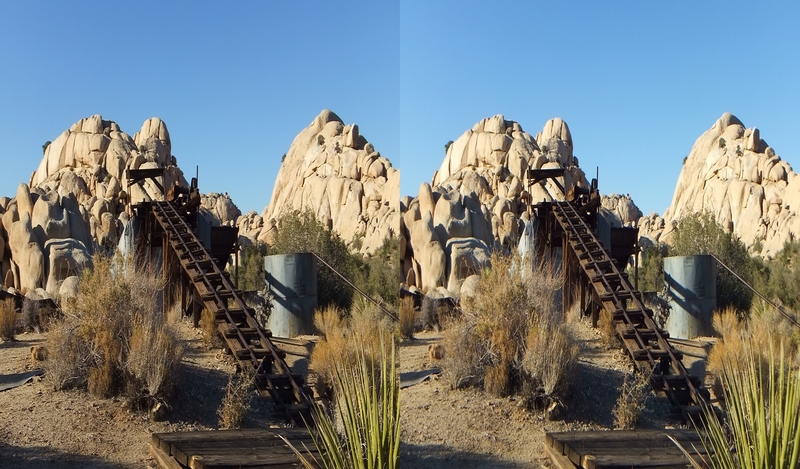 For 3D coverage of the Wall Street Mill itself, including ‘Uncle Willie’s Health Food Store,’ the rusty automobiles, a rickety but still upright windmill, and William Keys’s ‘I Done Killed Worth Bagley Here’ memorial stone, visit the Queen Valley Main Page. 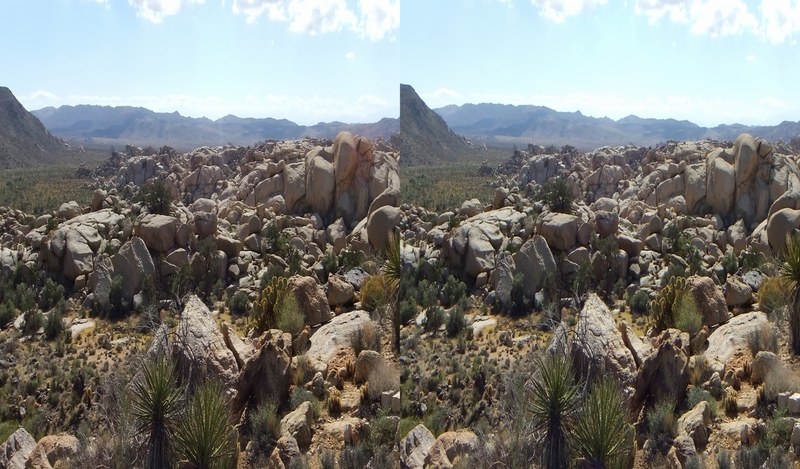 This 3D Overview covers the Near East periphery, with photographs taken from the Wall St. Mill trail and on the eastern hillside looking across the area. 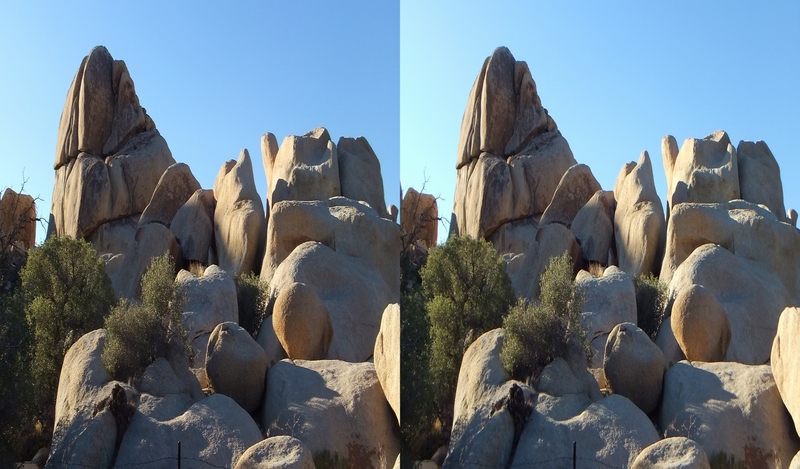 Closer inspection of the interesting rock formations will follow. 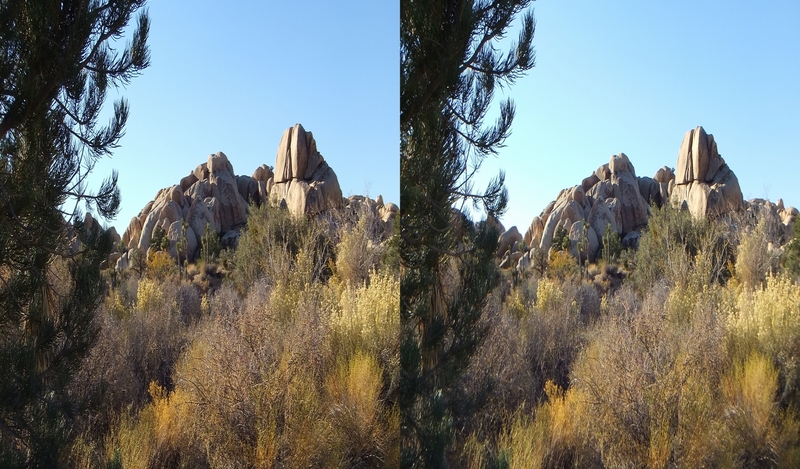 THE NEAR EAST SECTION OF QUEEN VALLEY from Uncle Willie’s Health Food Store to the Wall Street Mill comprises the mill site itself surrounded by a variety of photogenic rock piles. 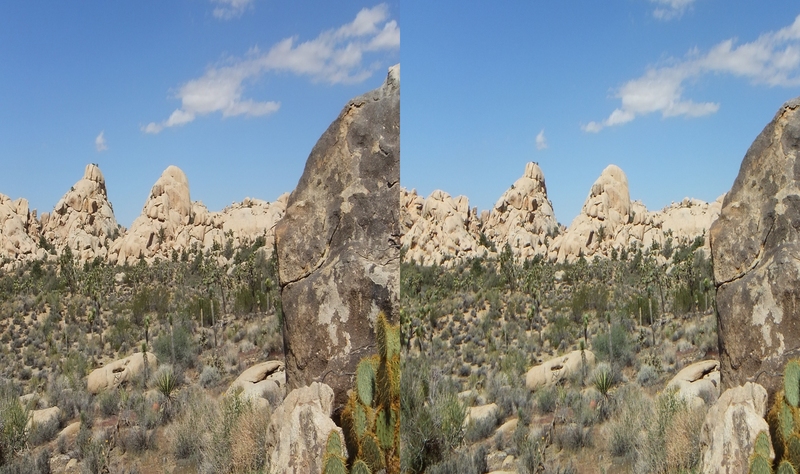 Hikers traversing the southern perimeter of Wonderland of Rocks have an easy approach to the crags and other key features. 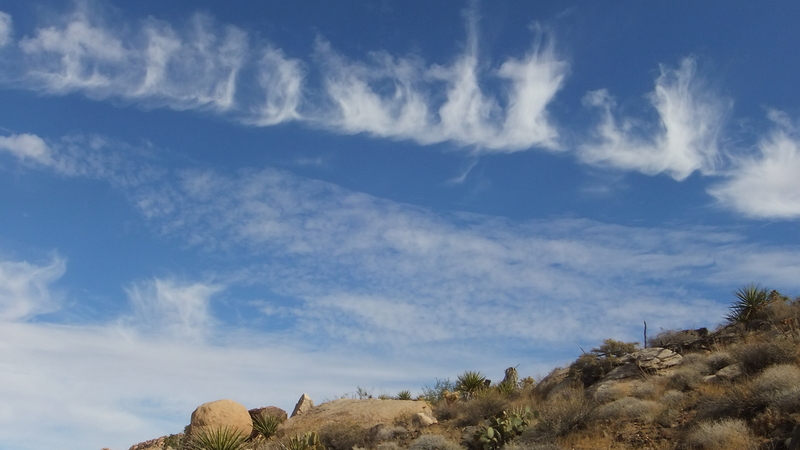 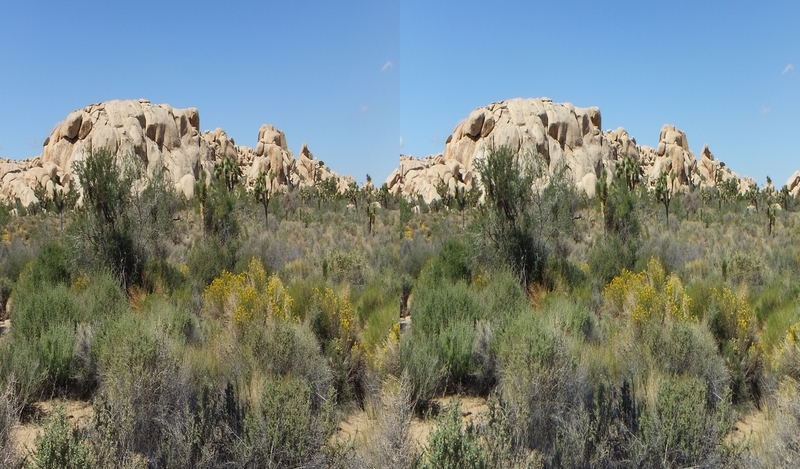 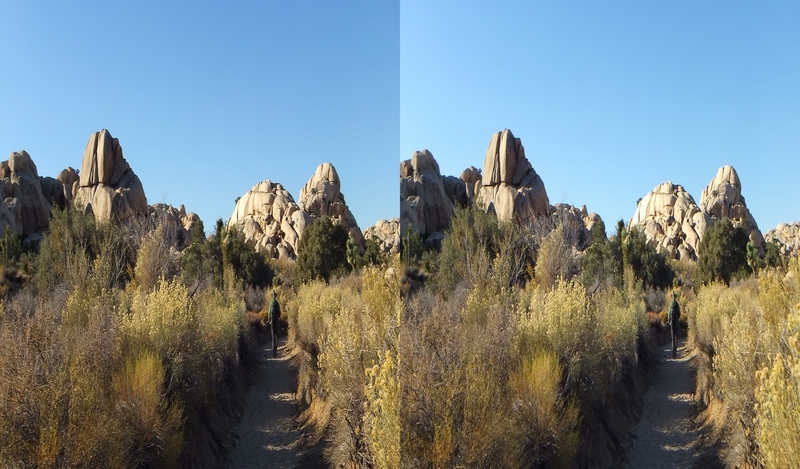 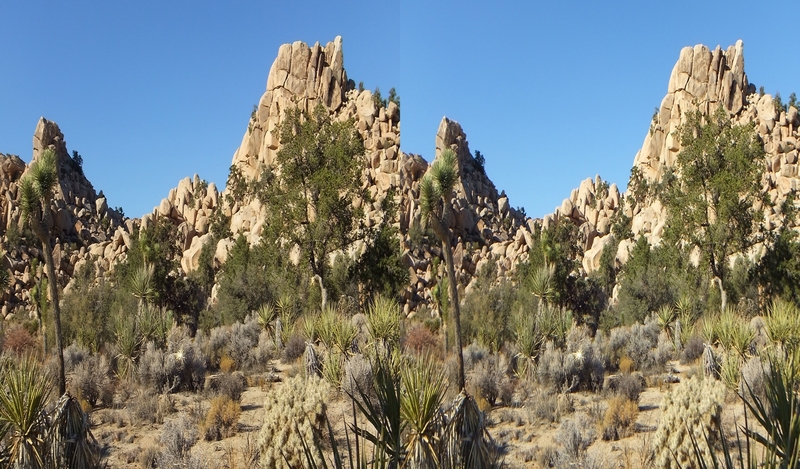 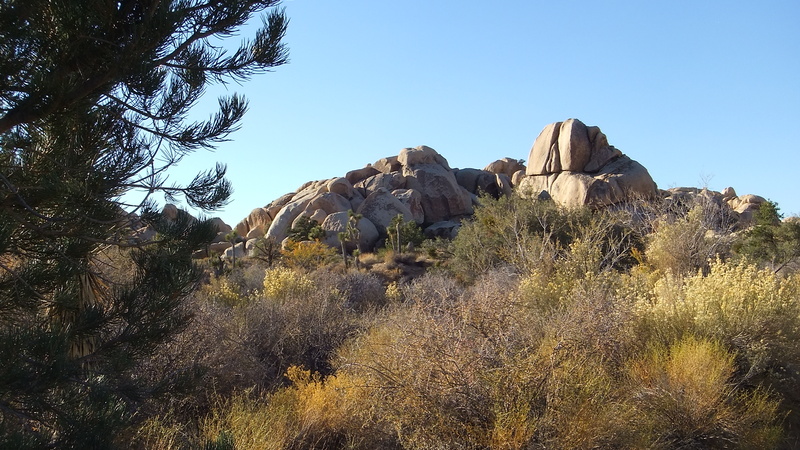 Moreover, the Mill hike is among the most popular in Joshua Tree Park, and is an easy three-quarter mile walk along an old dirt road. 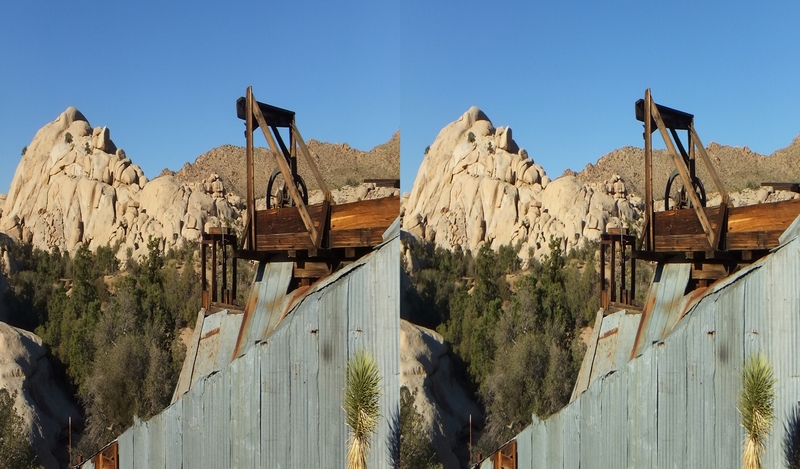 The Wall Street Mill proper is covered in a separate 3D Gallery. 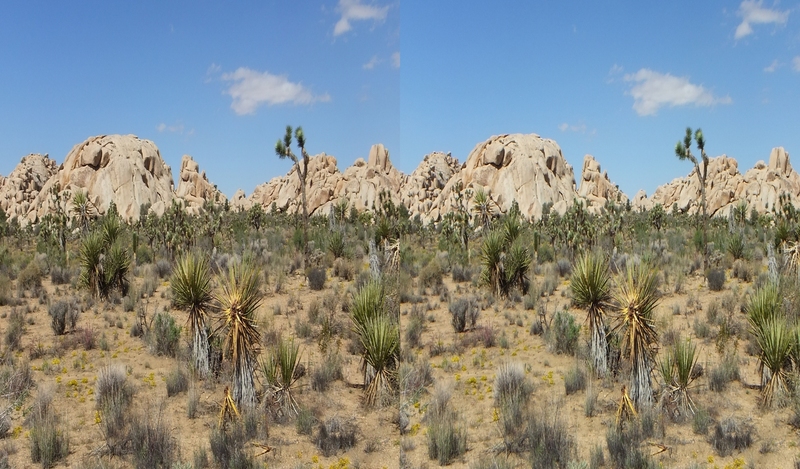 I visited this area on three separate occasions: once in November 2012 with Cali49, where conditions were dry, California having experienced a drought; a second trip in September 2013 with “Bucko” following summer thunderstorms that had brightened the foliage and sprinkled the ground with a beautiful golden carpet; and a third solo trip in October 2013 after the summer blush of color had been baked away. 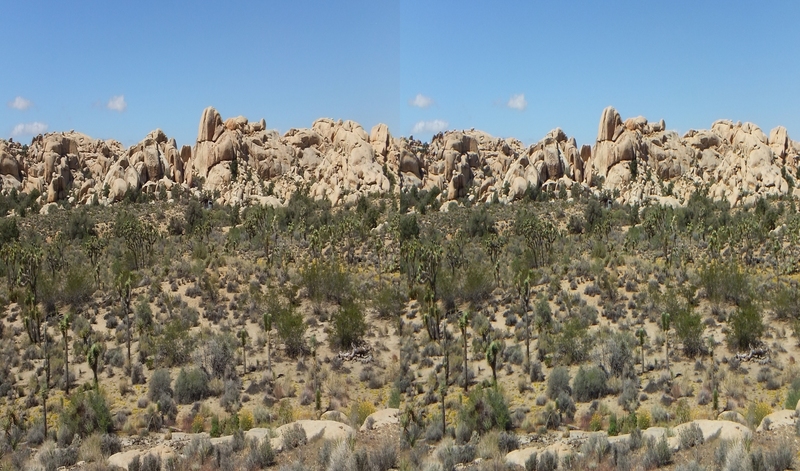 On two of the trips, I took photographs from a hillside immediately to the east. 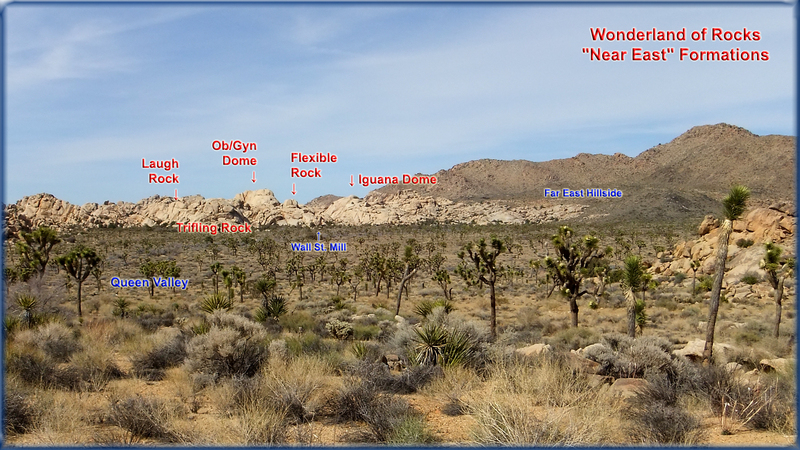 This provides a stunning look into the rock climber’s curiously named formations. 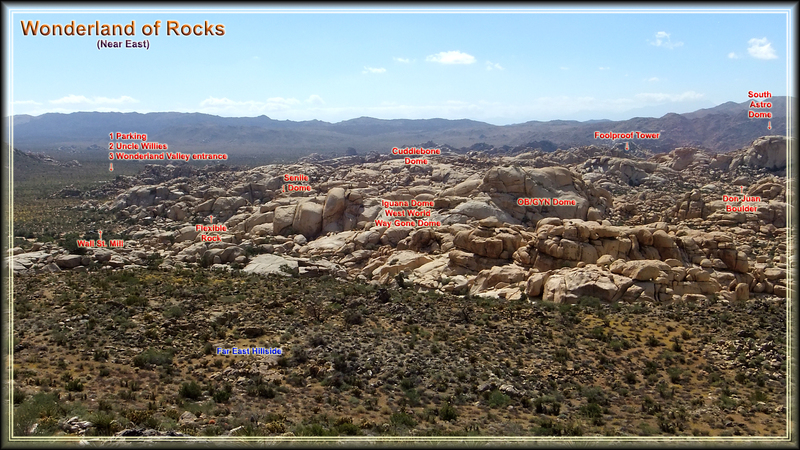 Geologists guesstimate the granite is between 85 and 150 million years old. 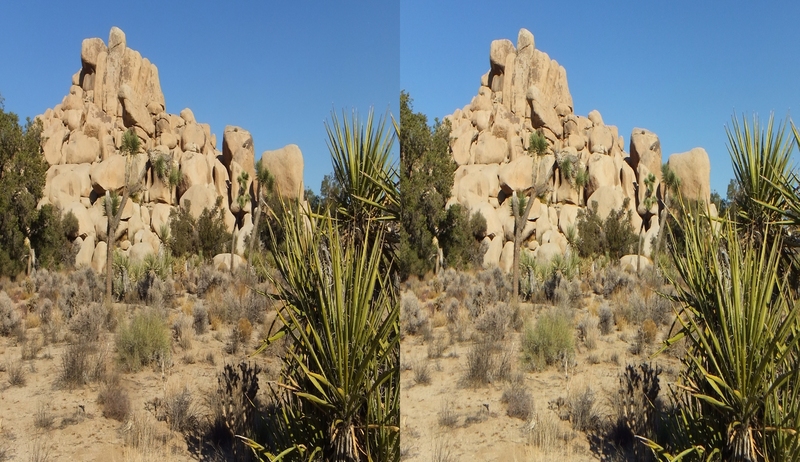 It eroded during wetter conditions. 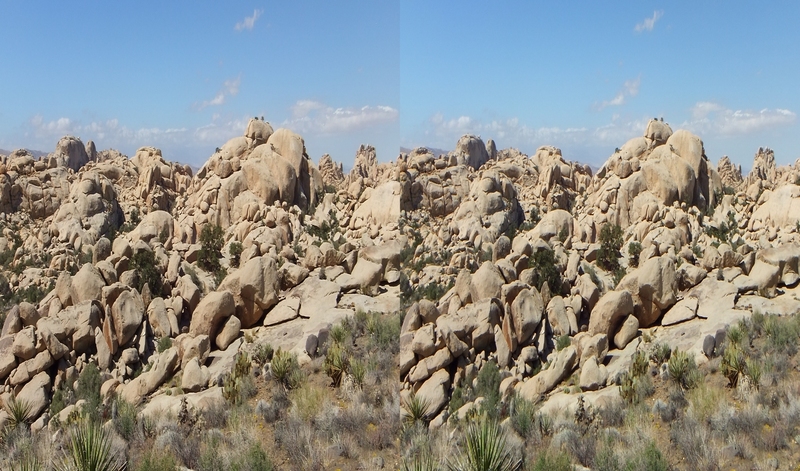 In the last several million years, as the local conditions changed (due to the rain-shadow effect of swiftly rising mountains to the north and west), the granite inselbergs were left as you see them today. 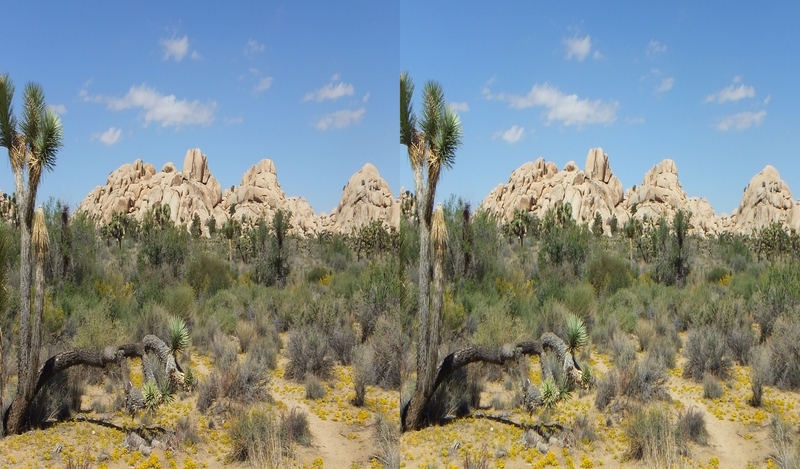 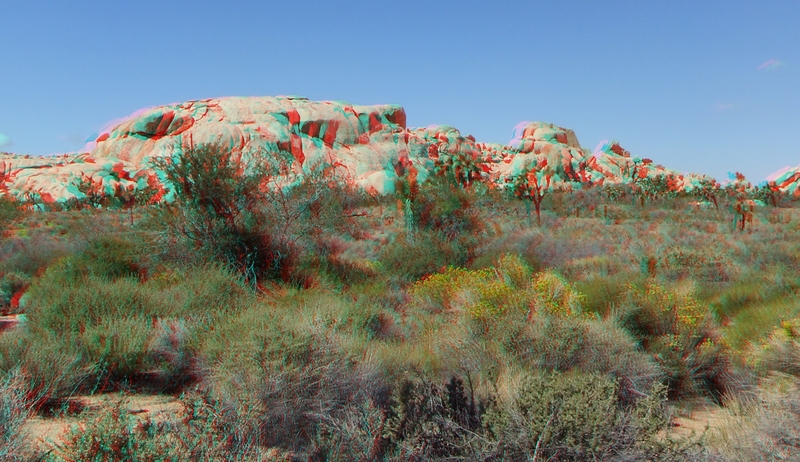 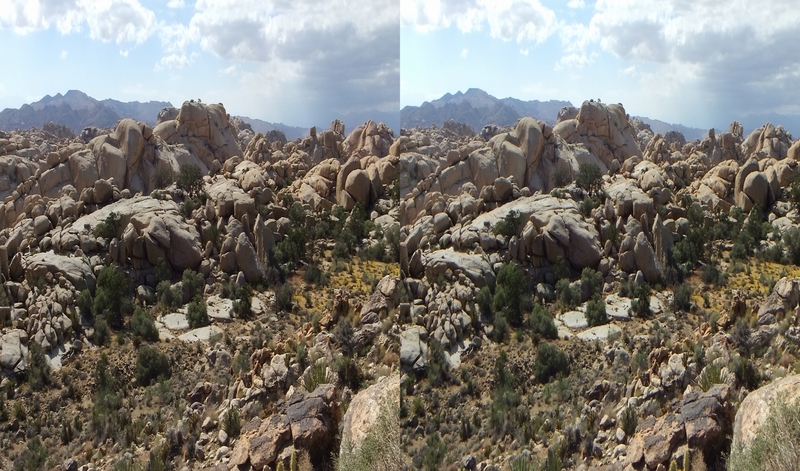 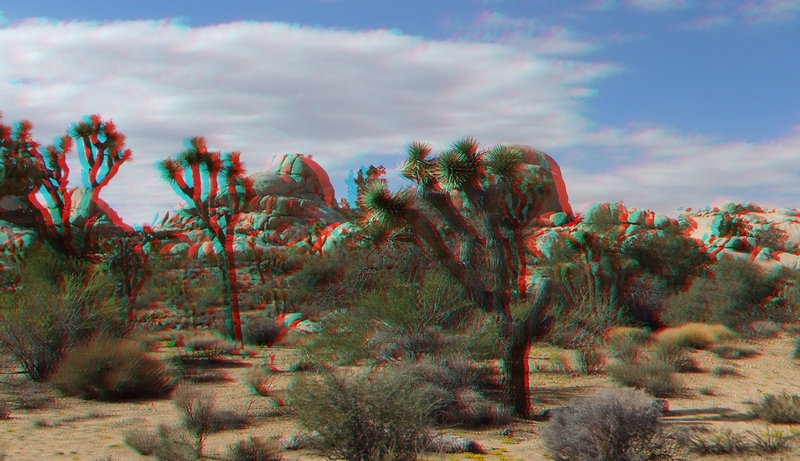 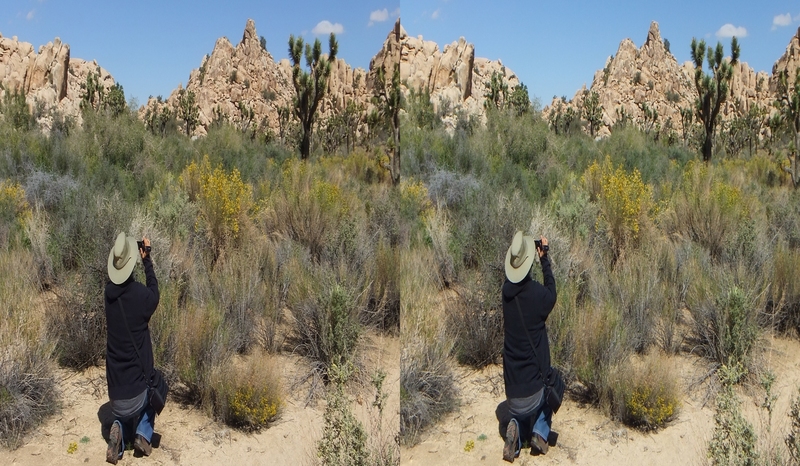 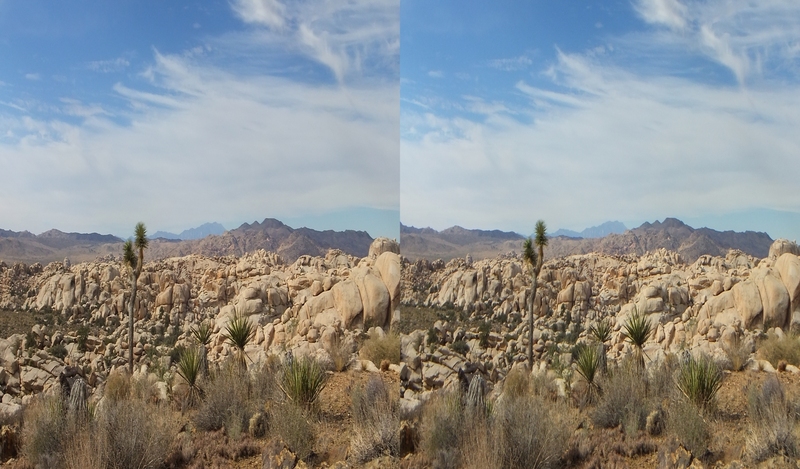 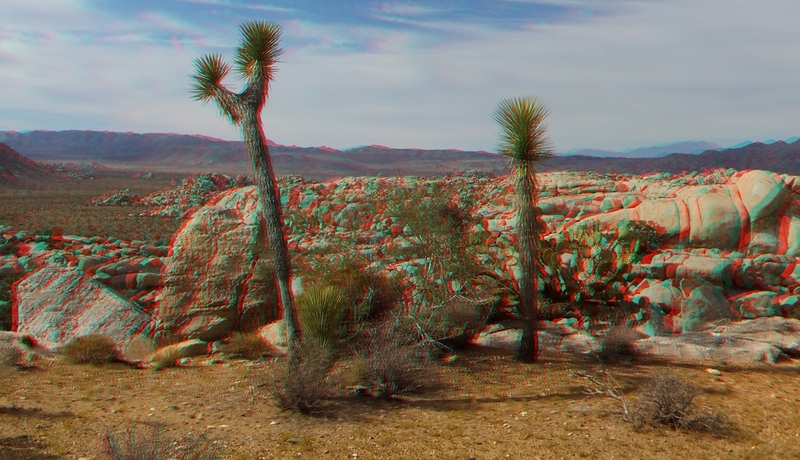 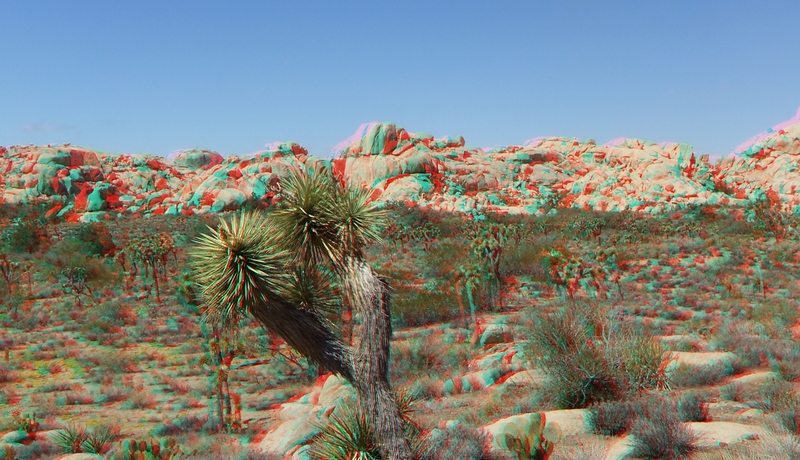 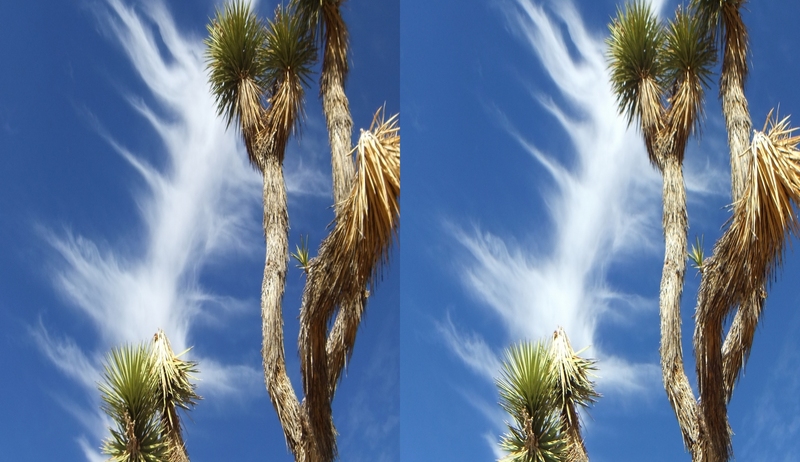 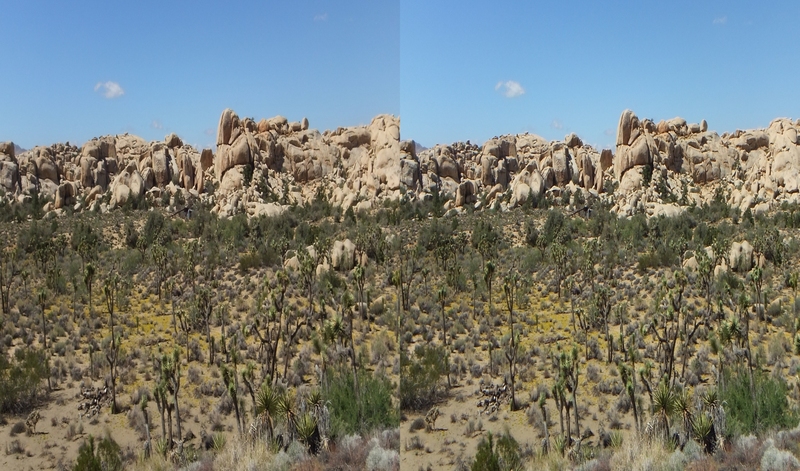 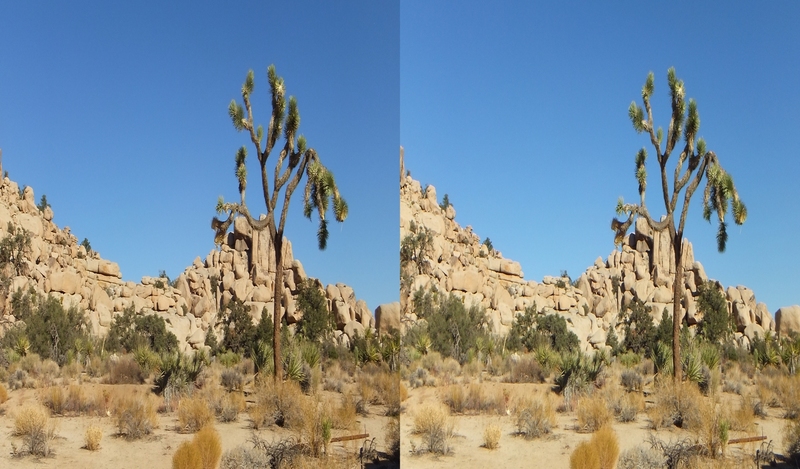 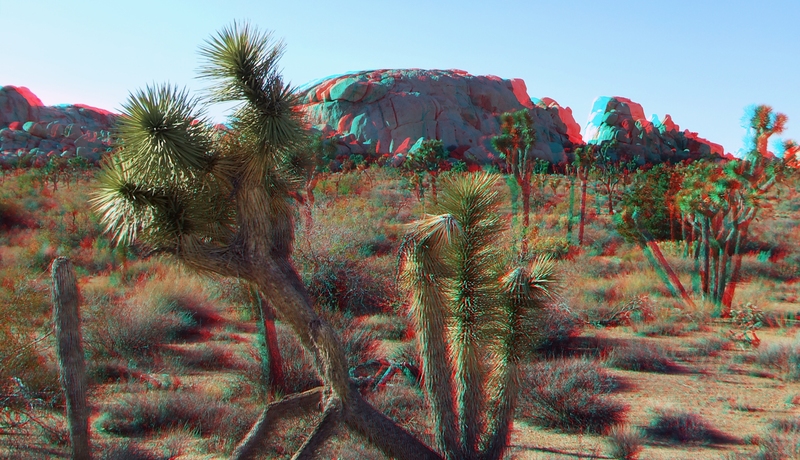 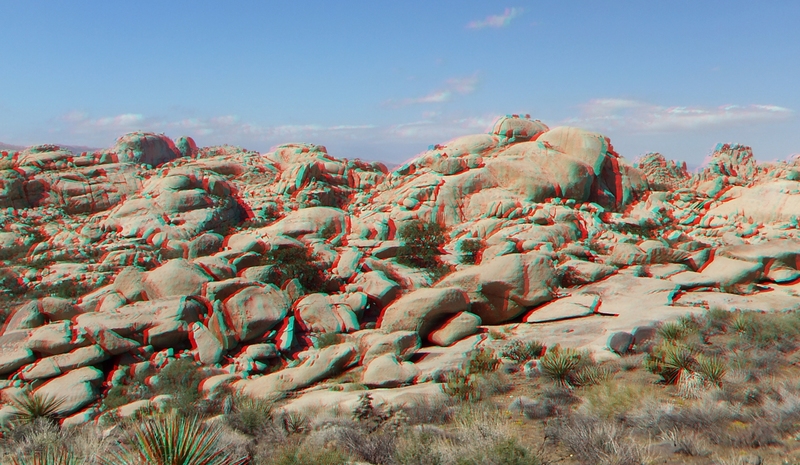 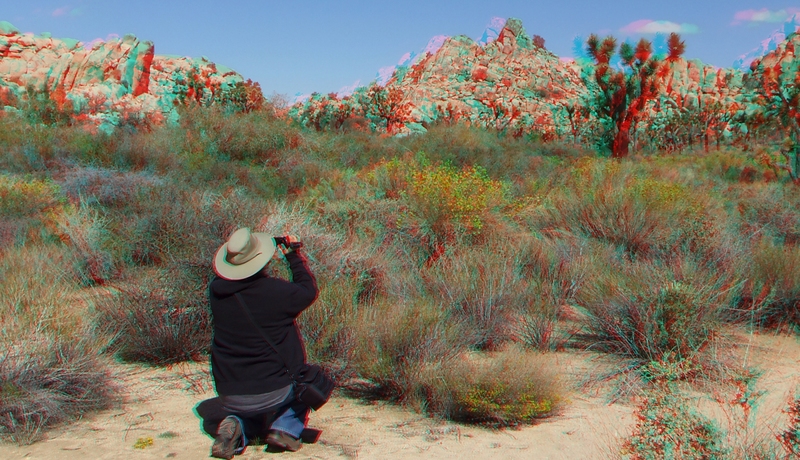 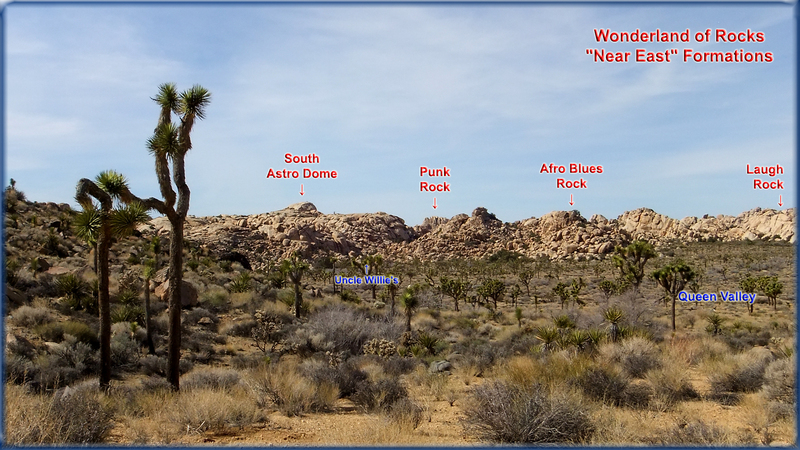 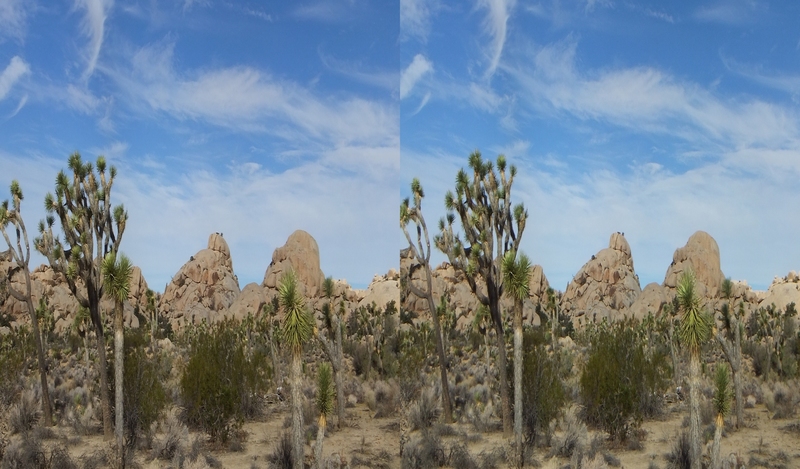 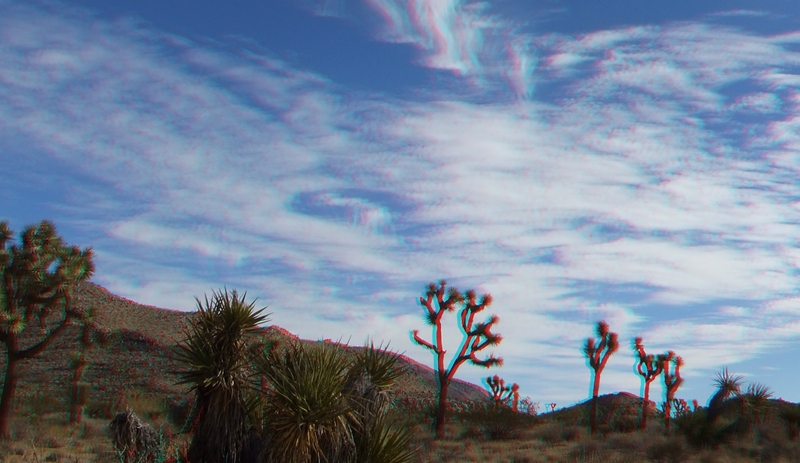 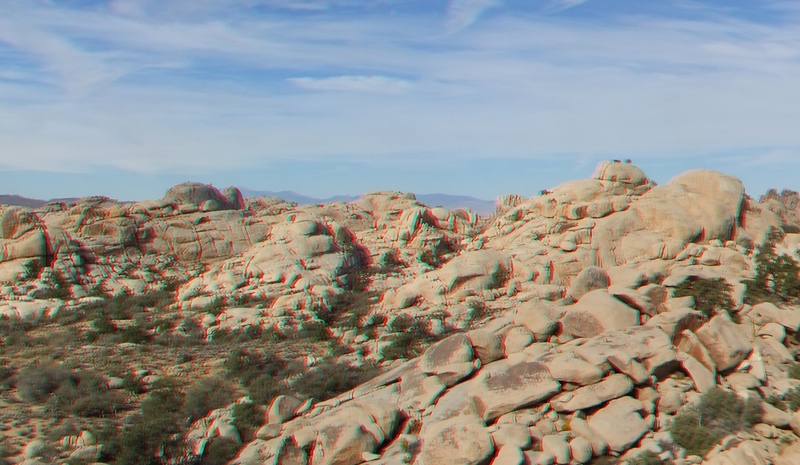 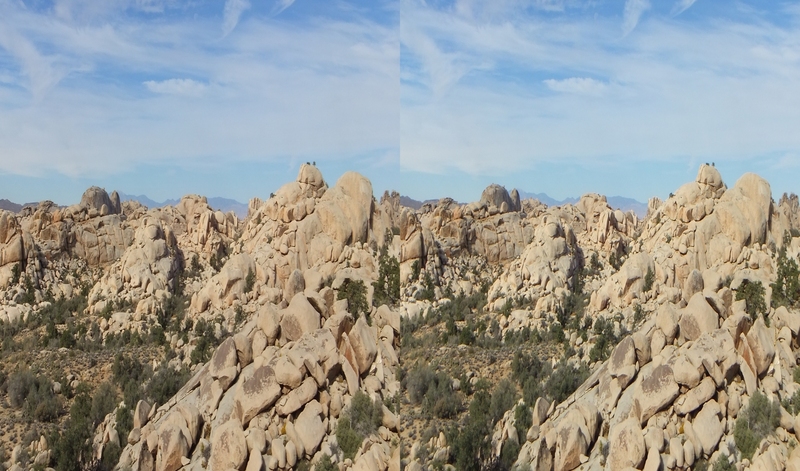 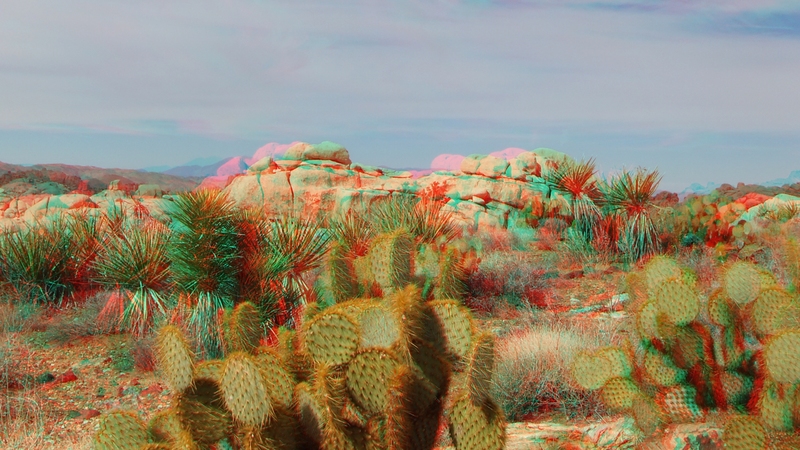 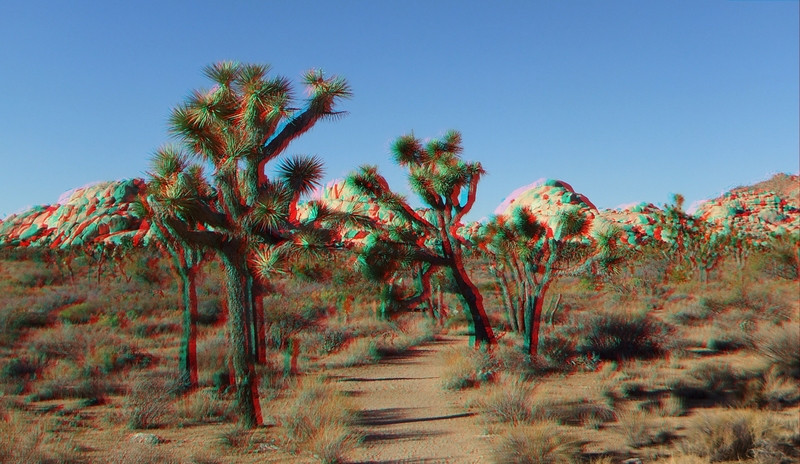 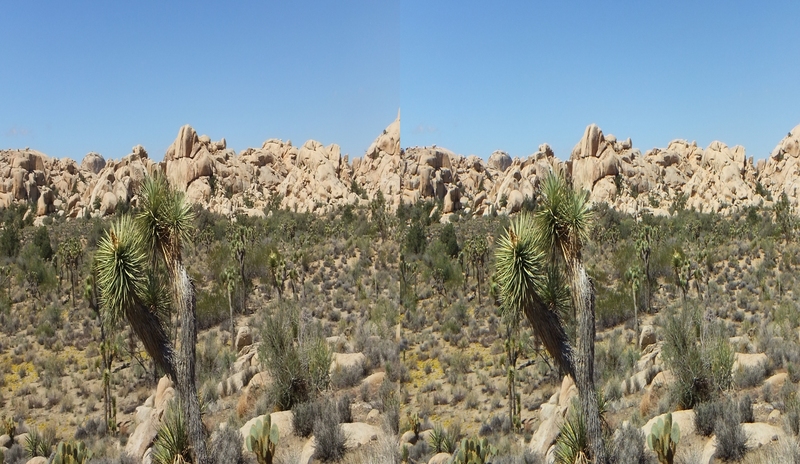 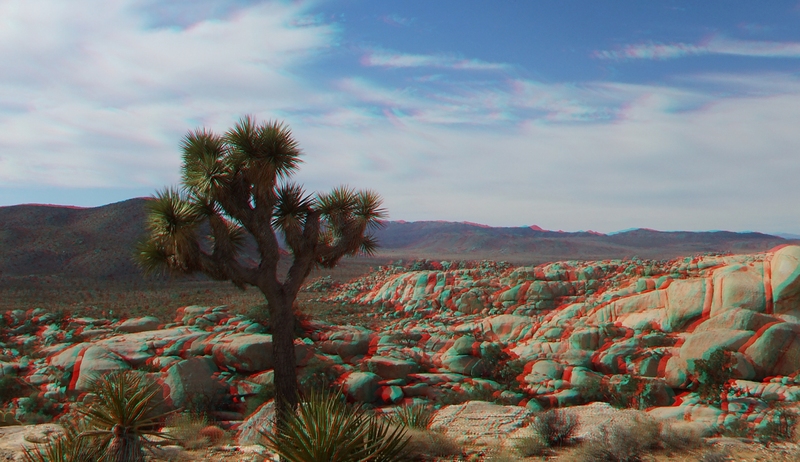 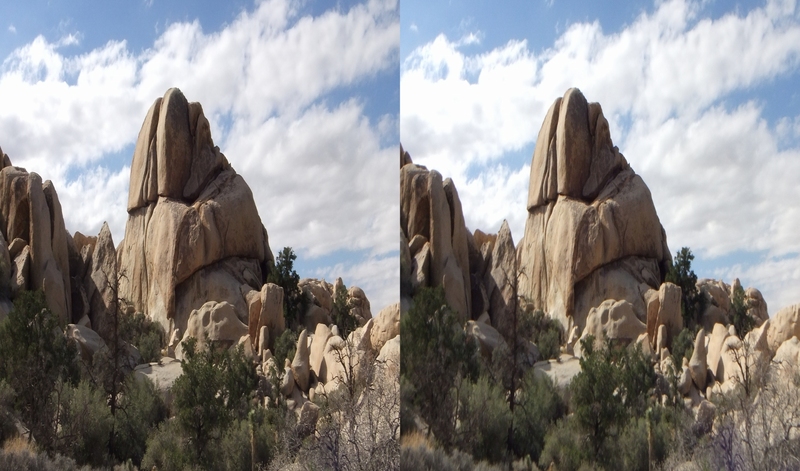 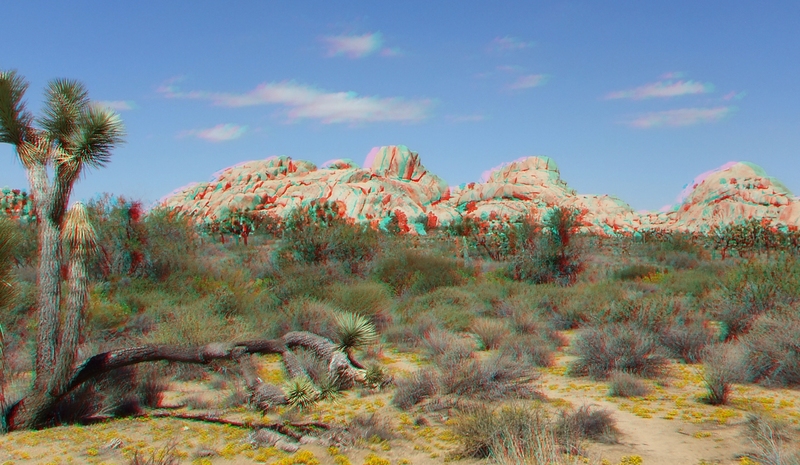 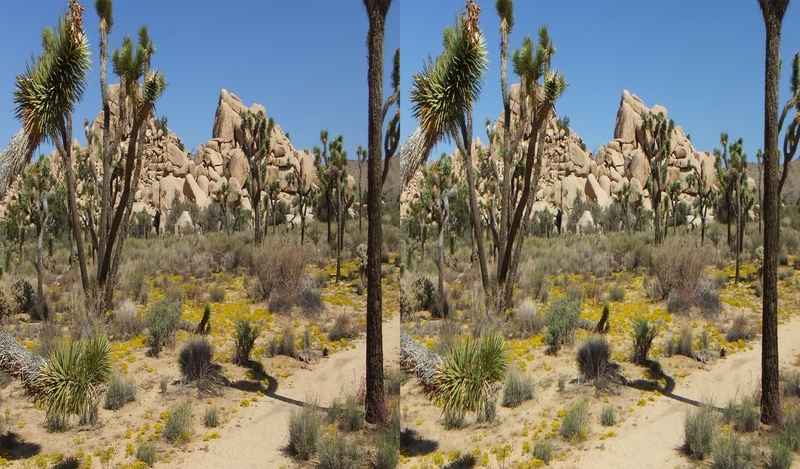 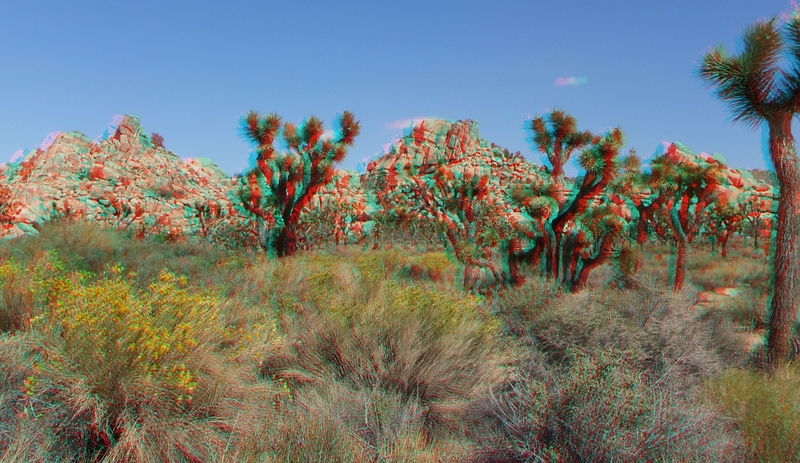 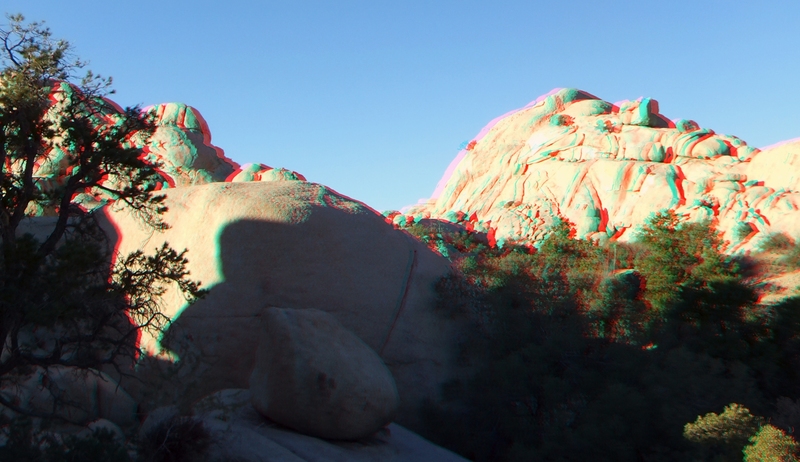 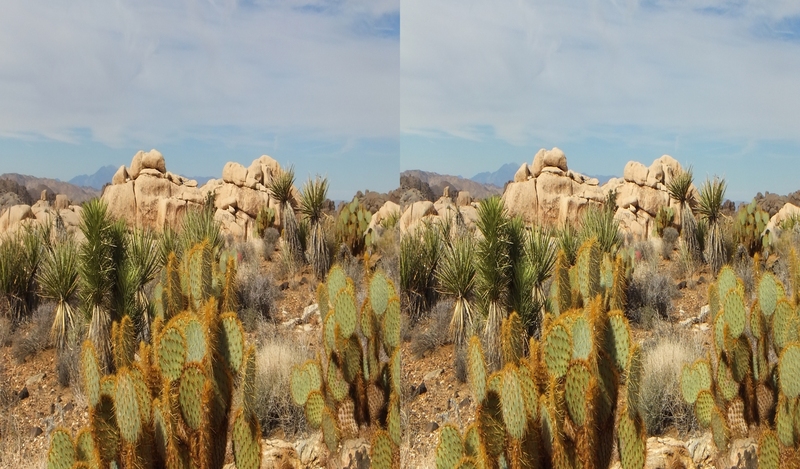 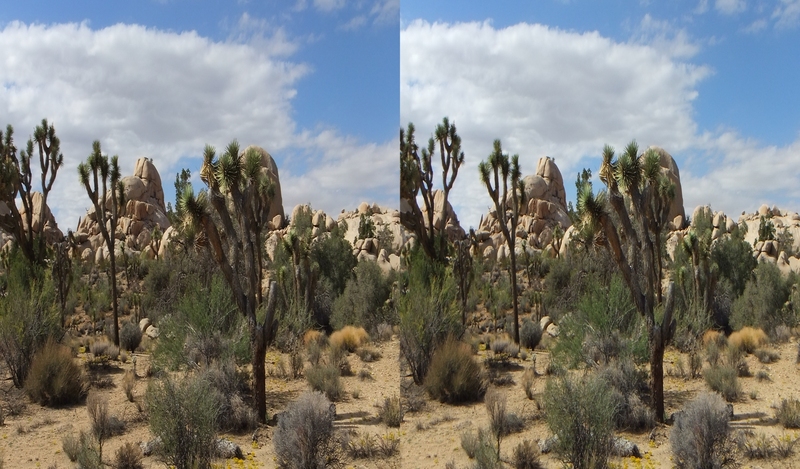 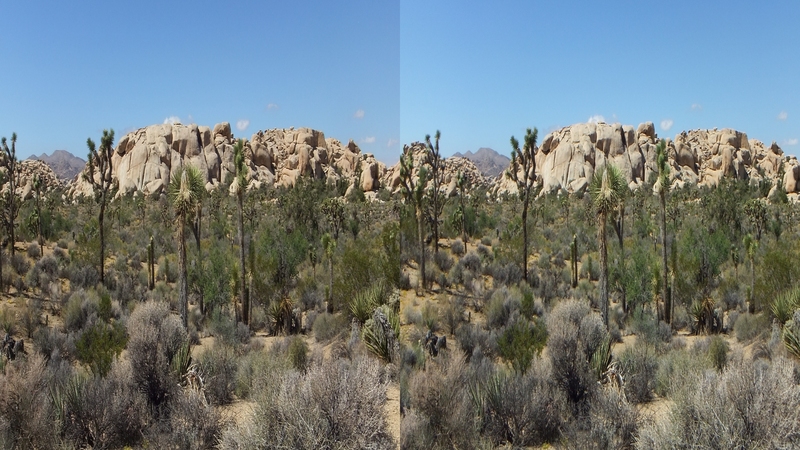 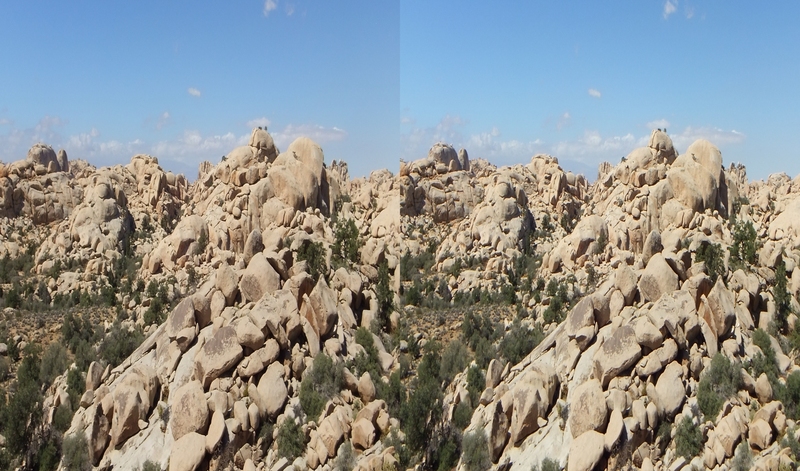 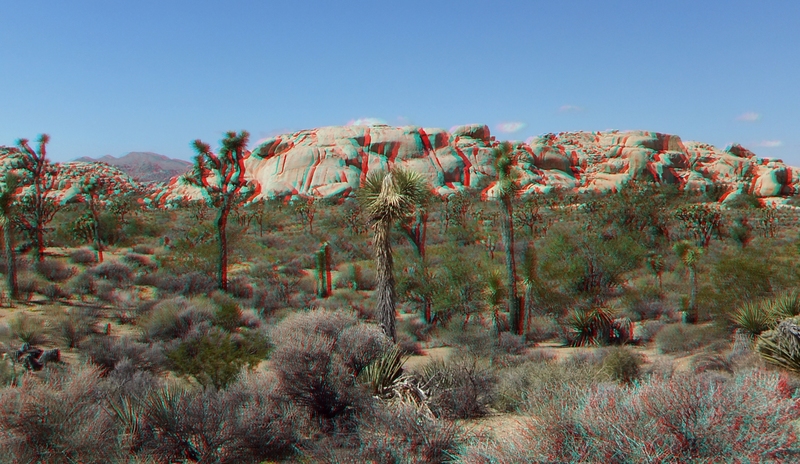 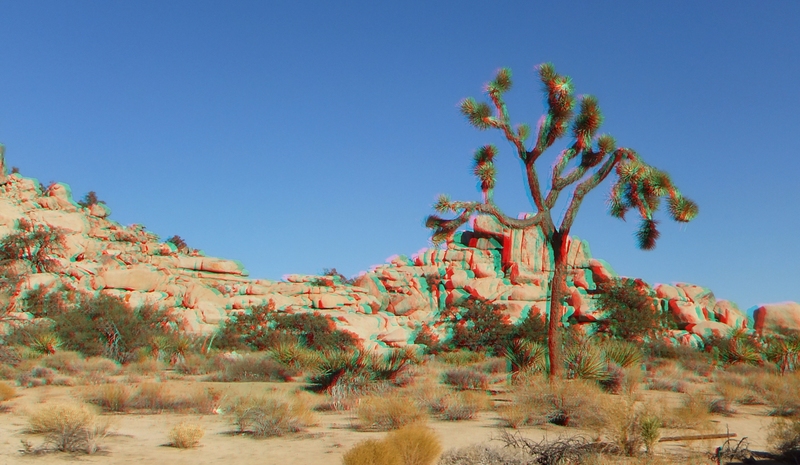 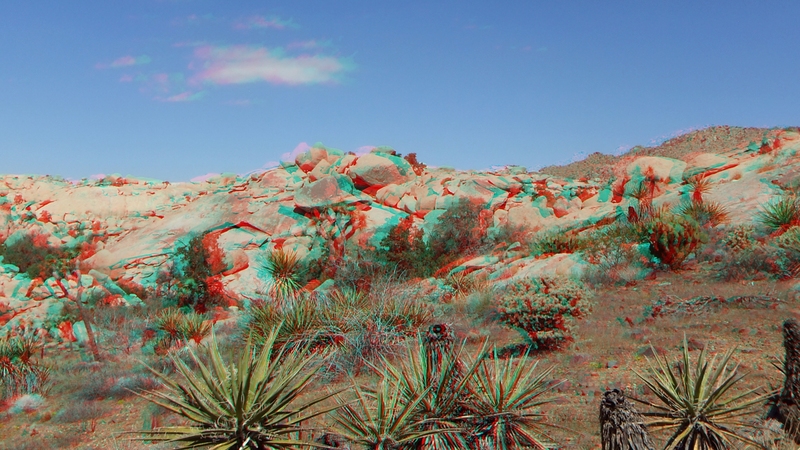 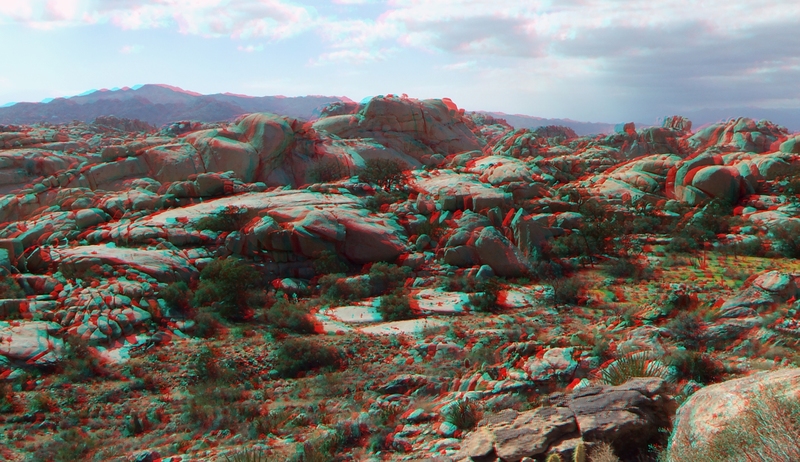 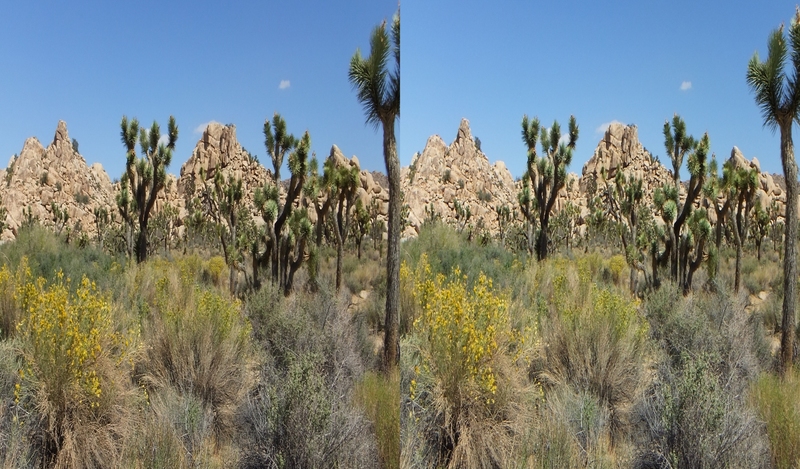 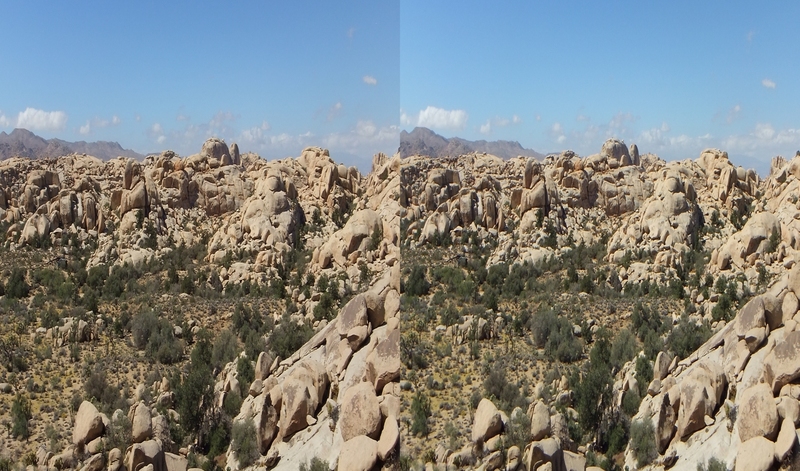 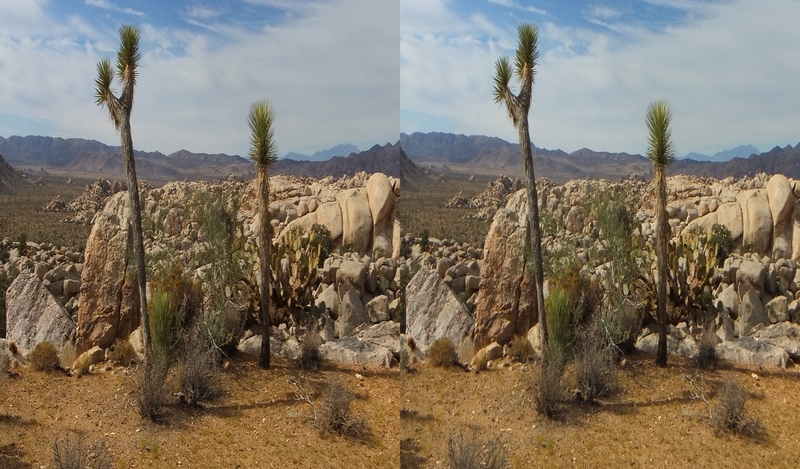 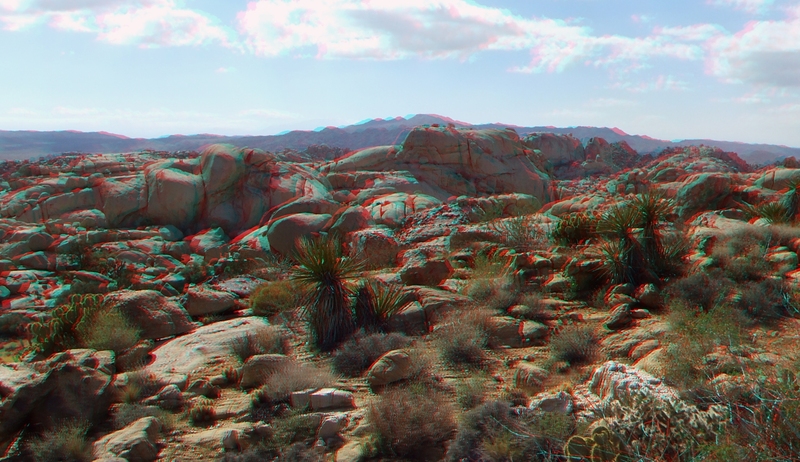 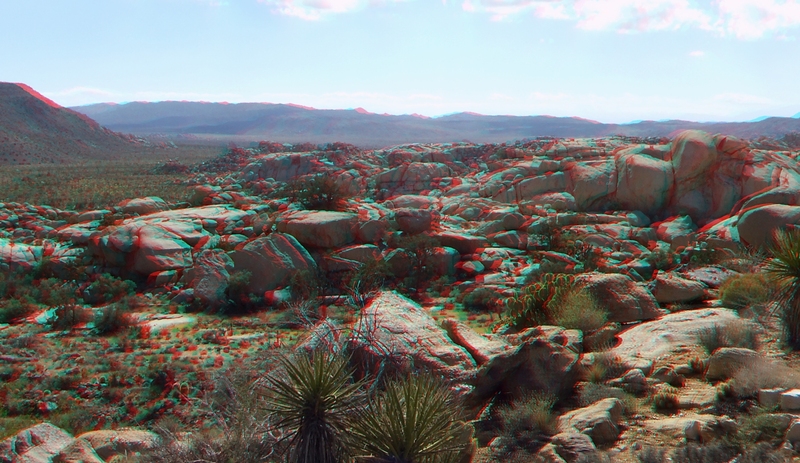 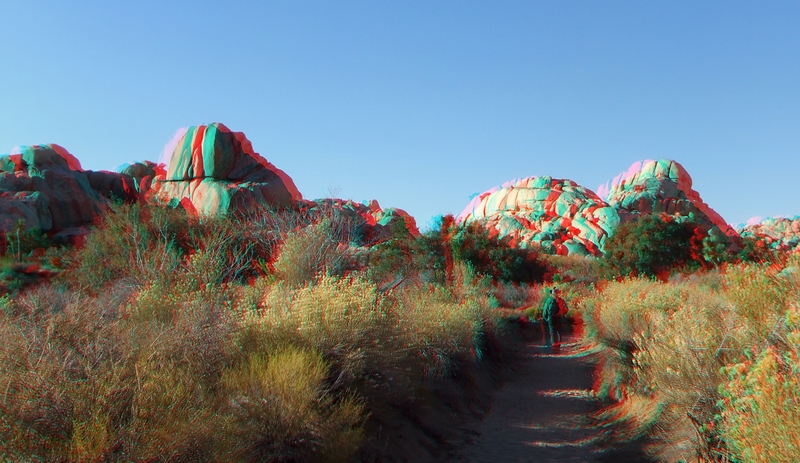 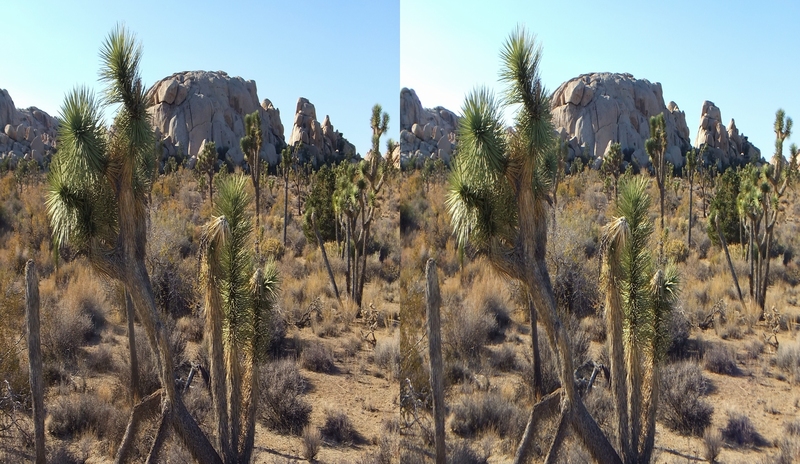 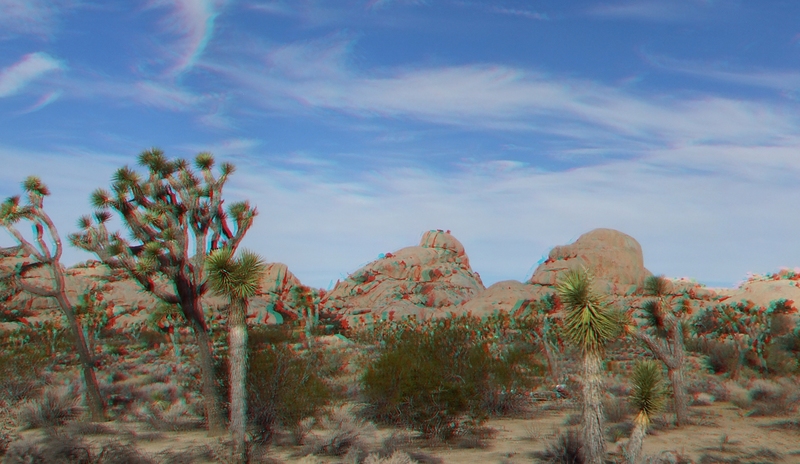 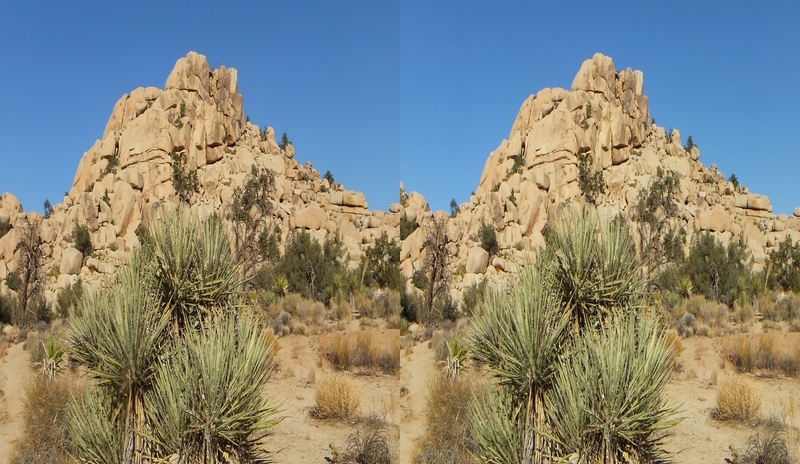 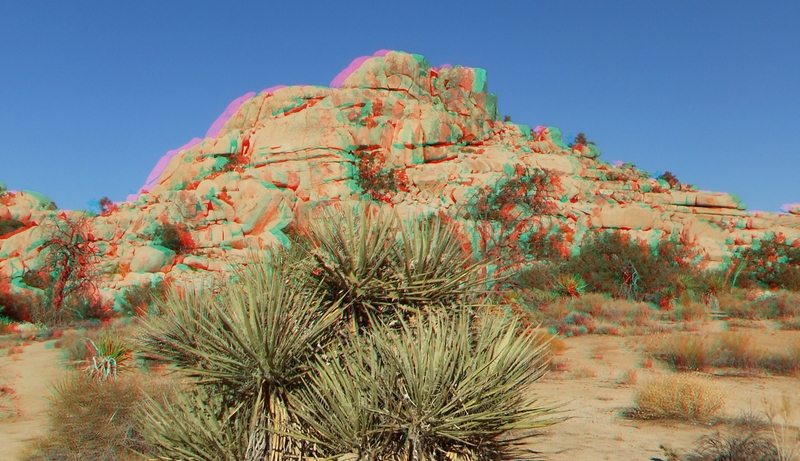 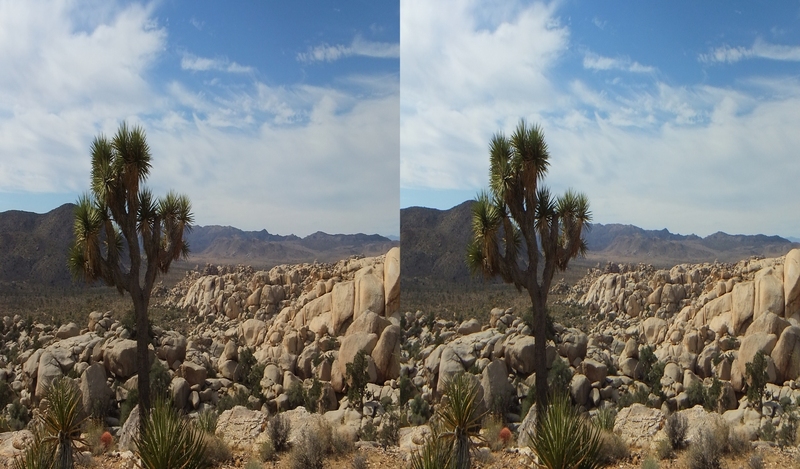 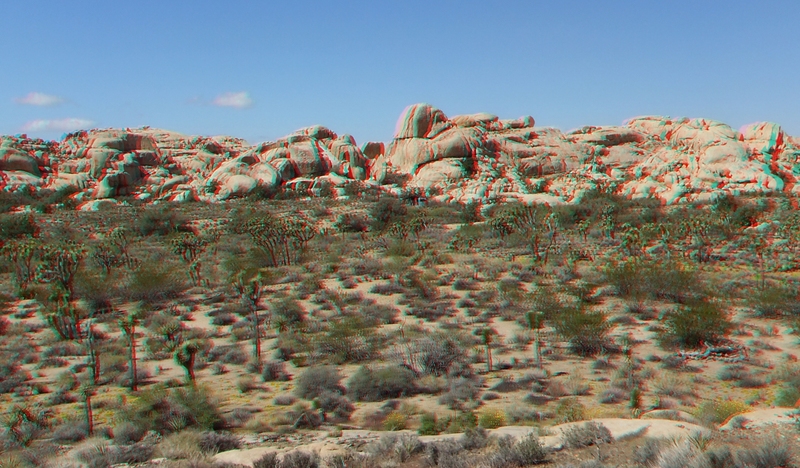 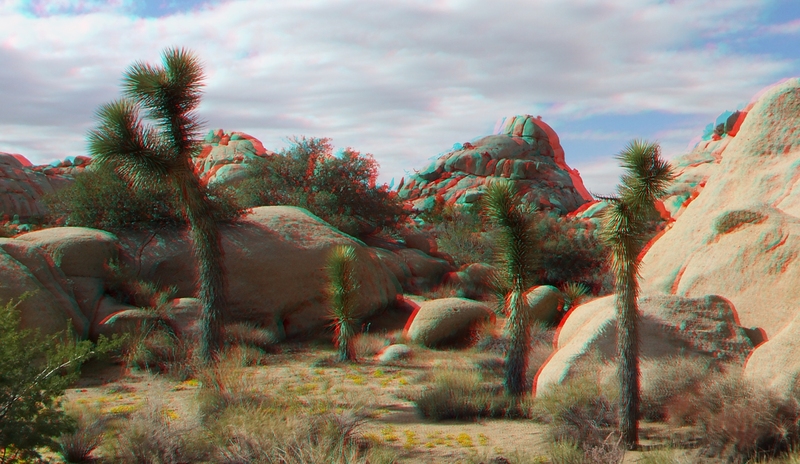 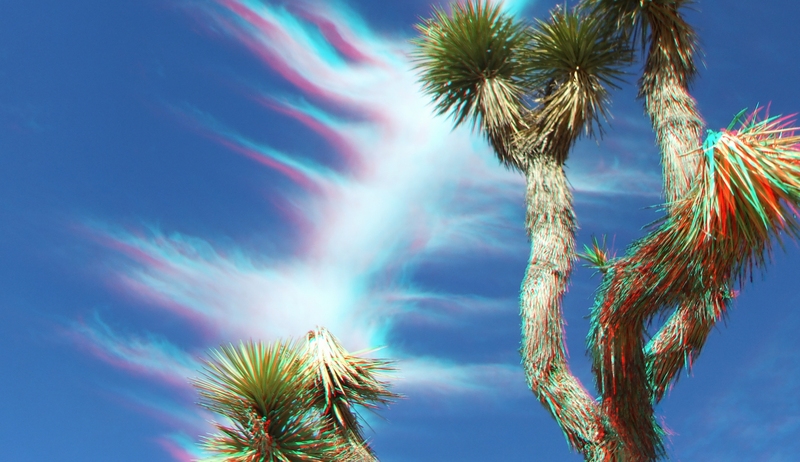 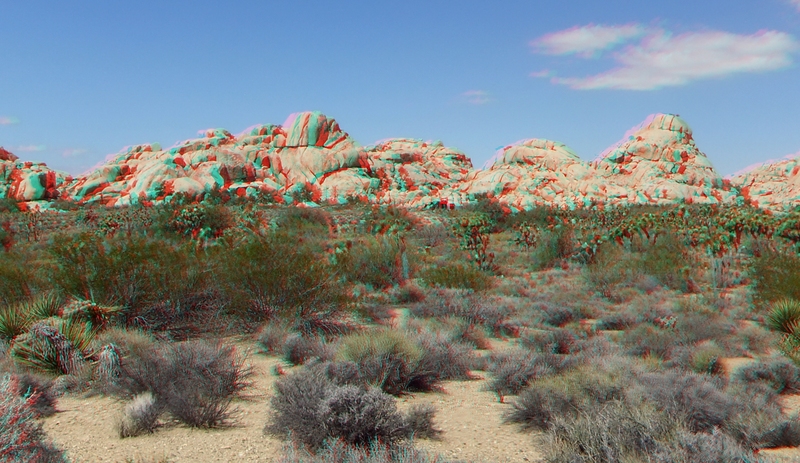 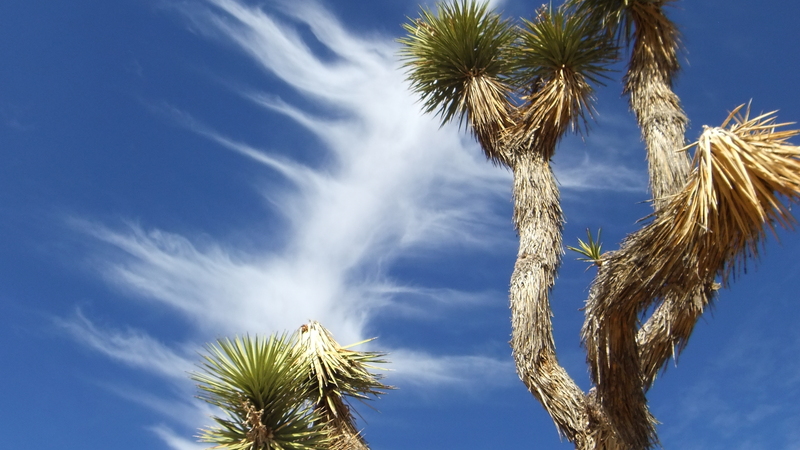 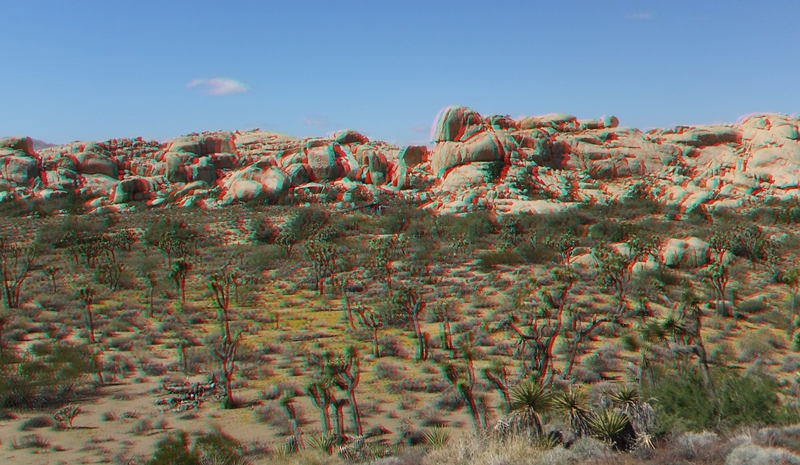 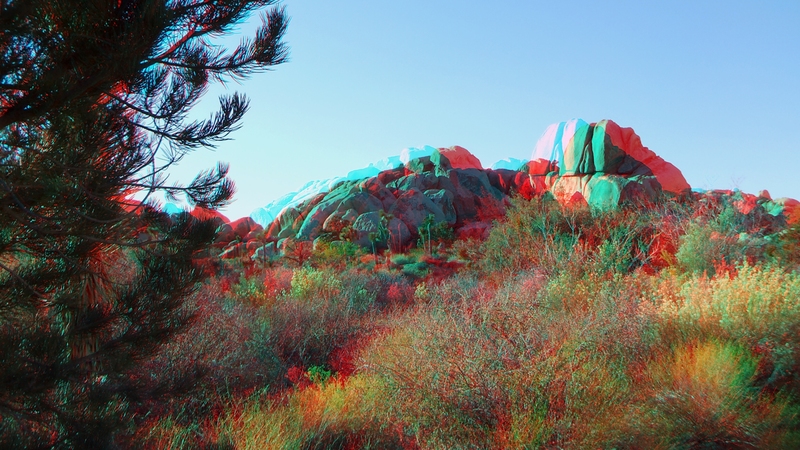 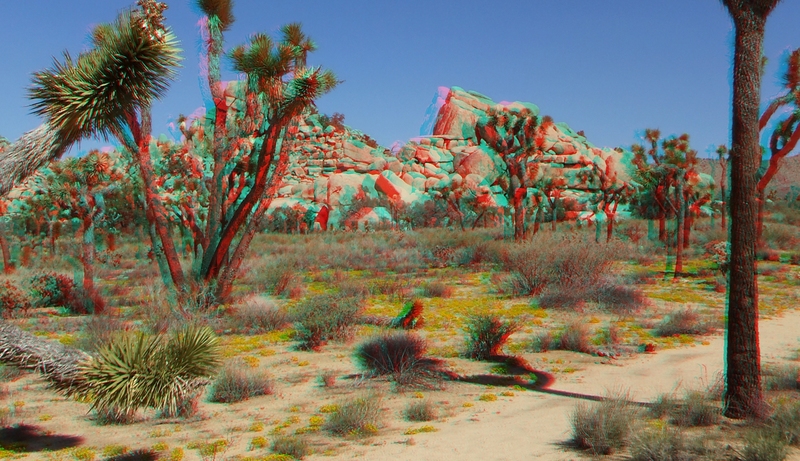 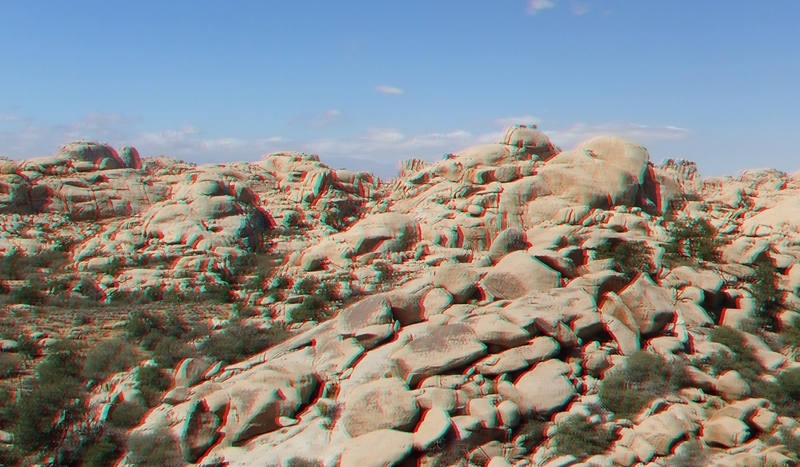 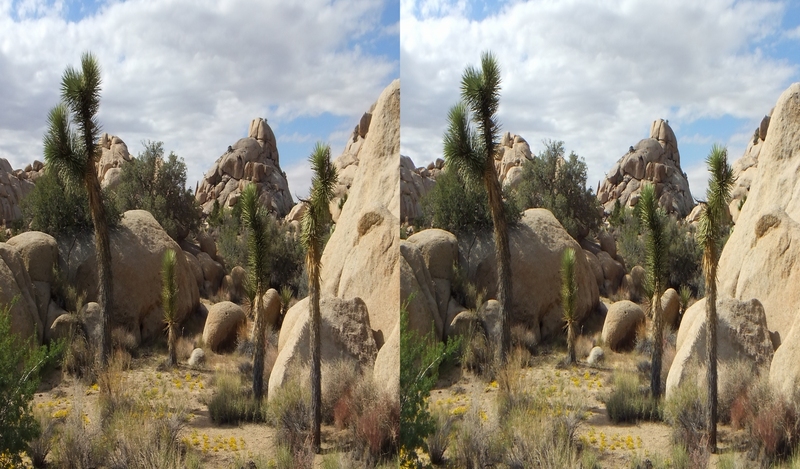 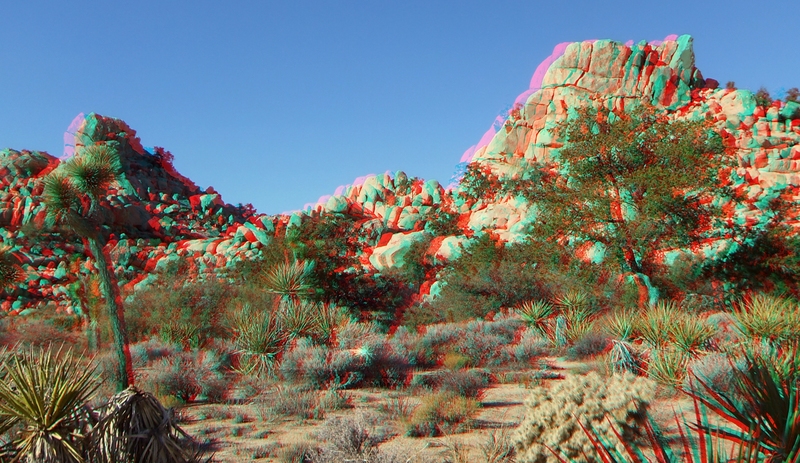 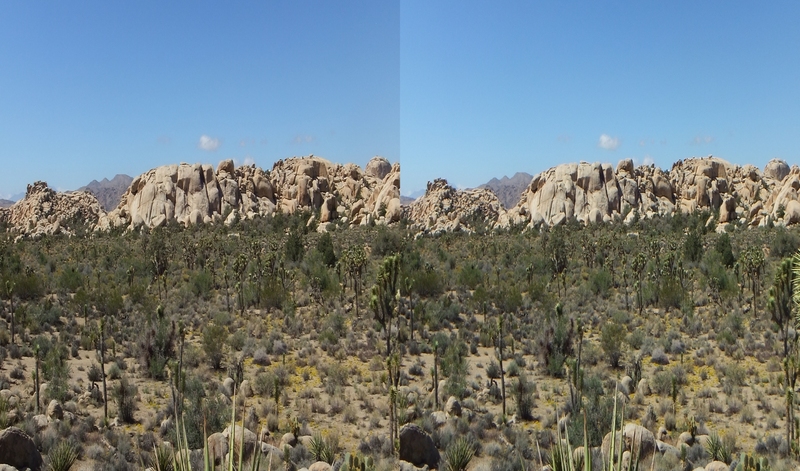 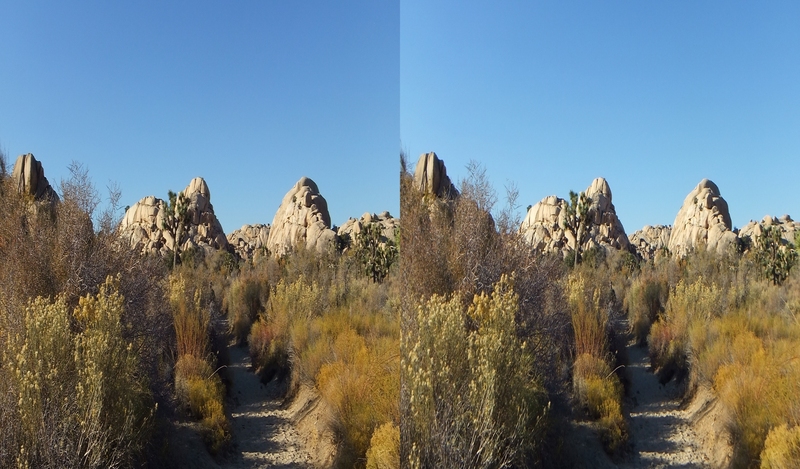 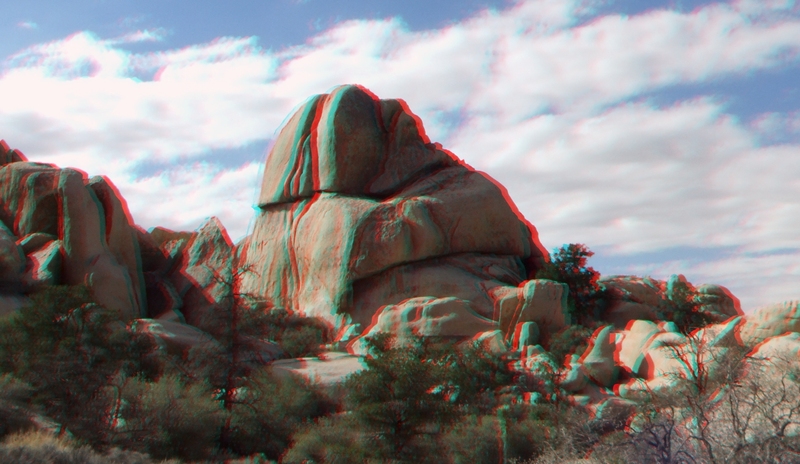 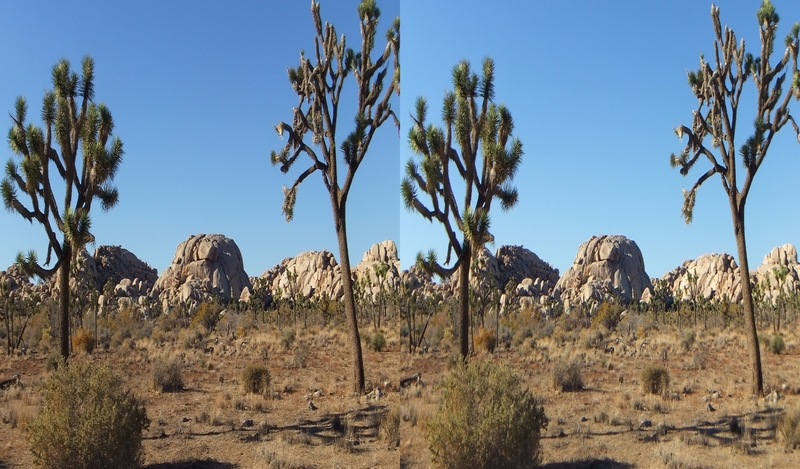 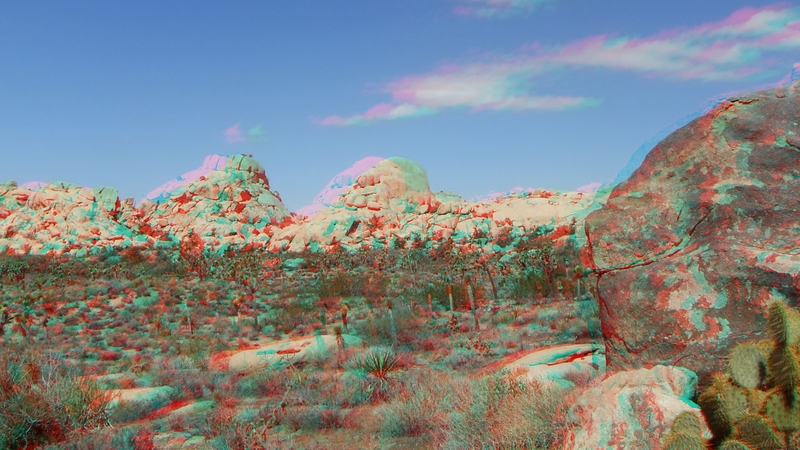 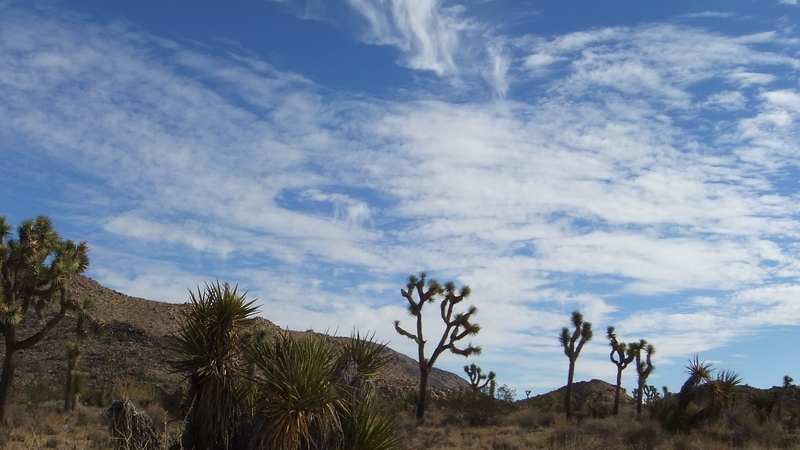 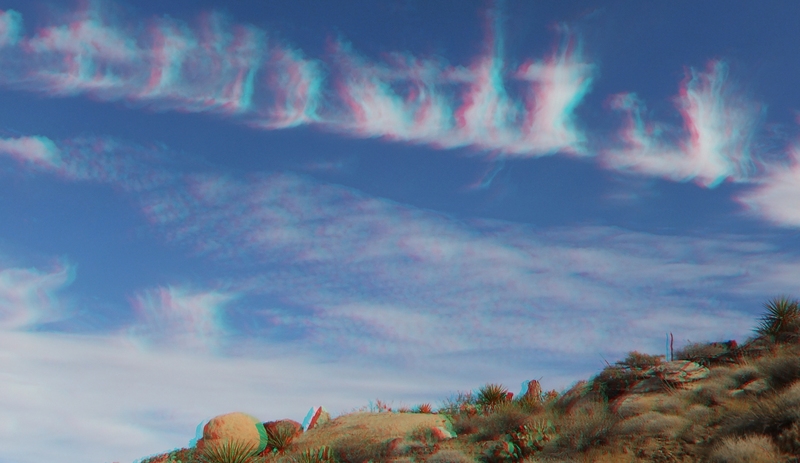 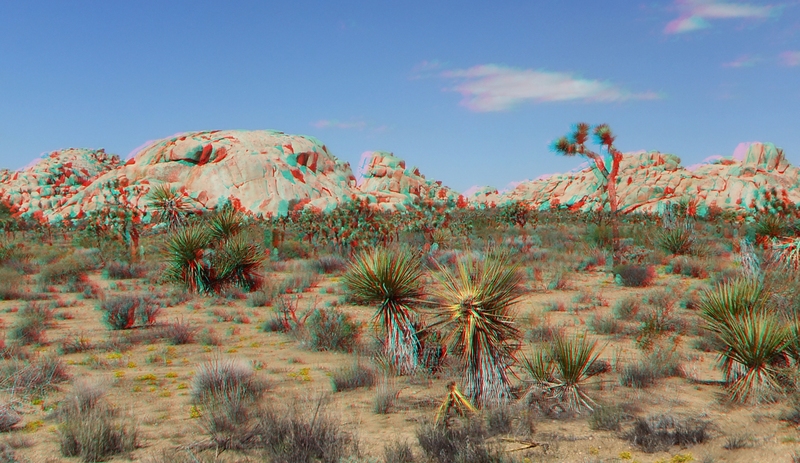 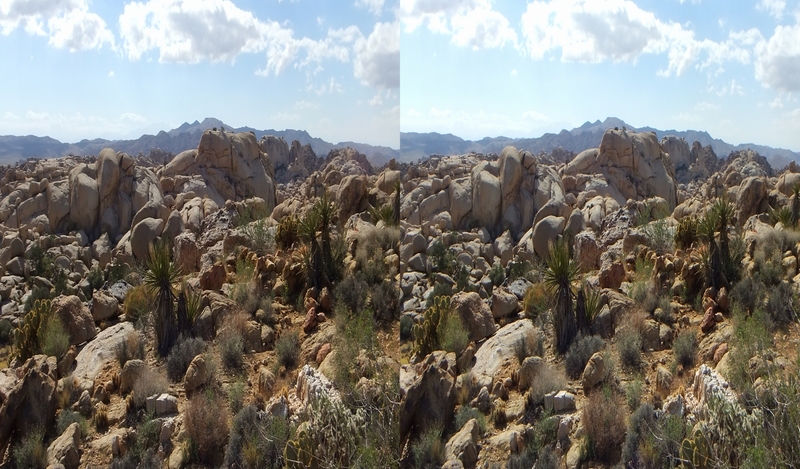 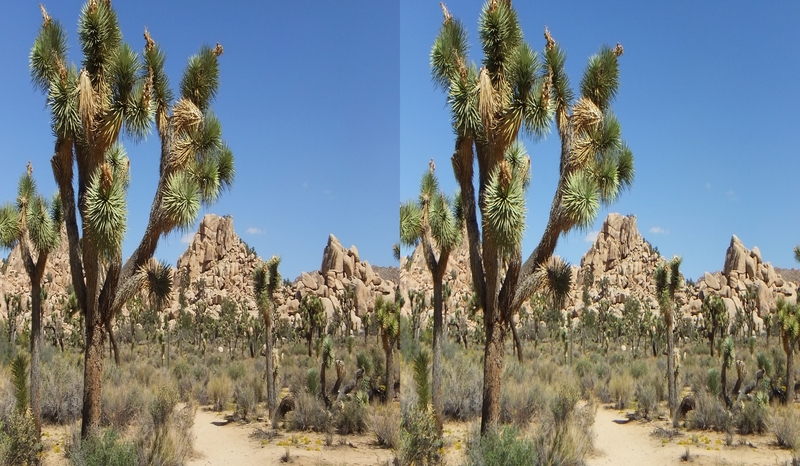 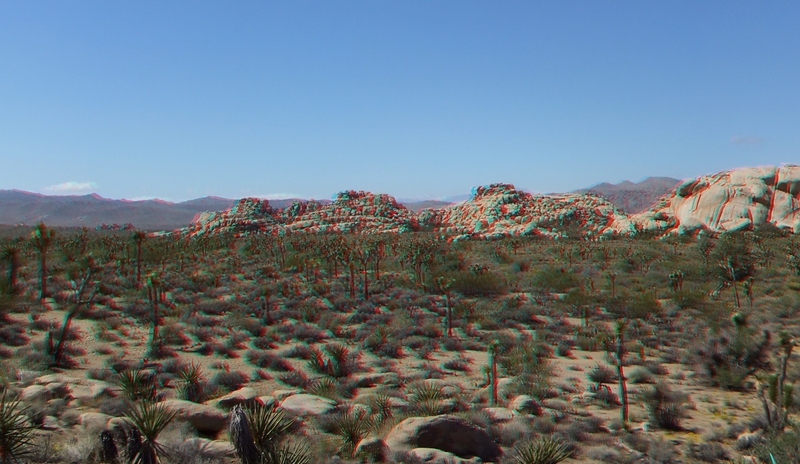 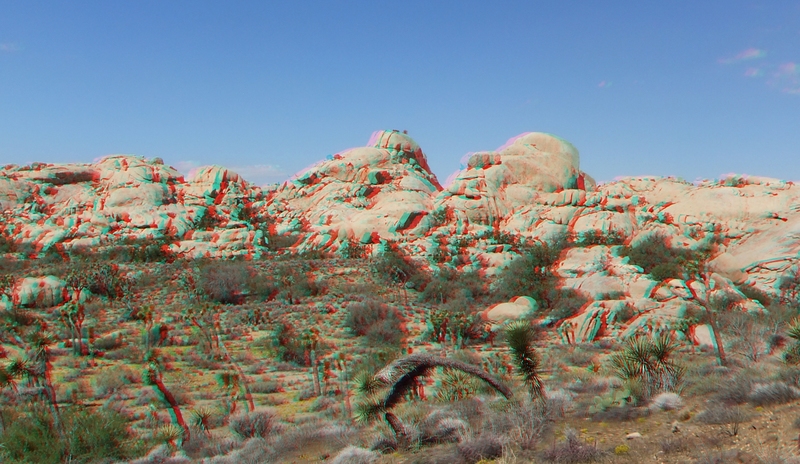 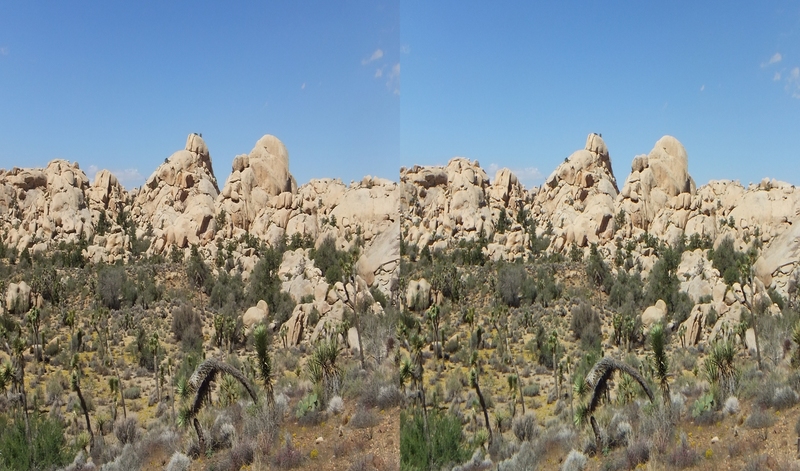 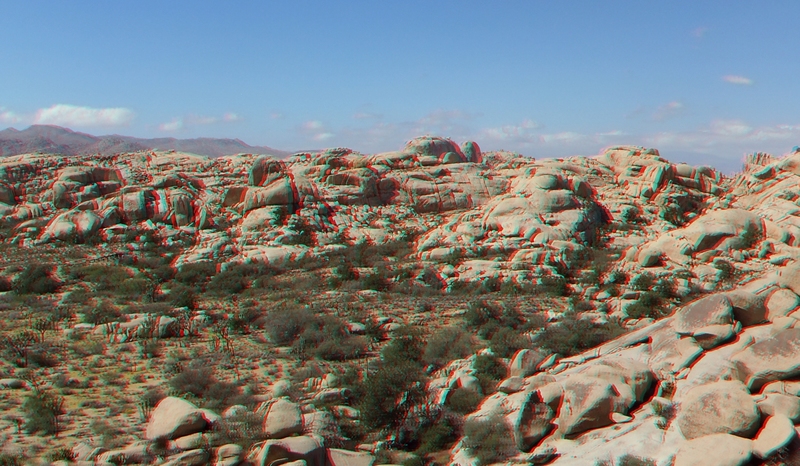 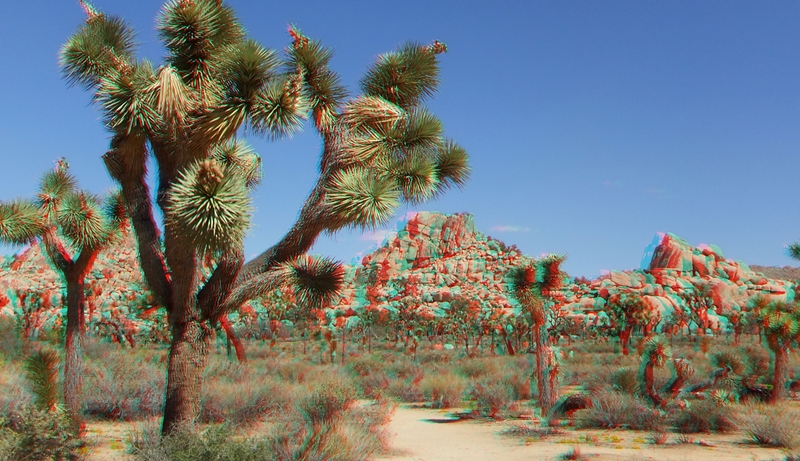 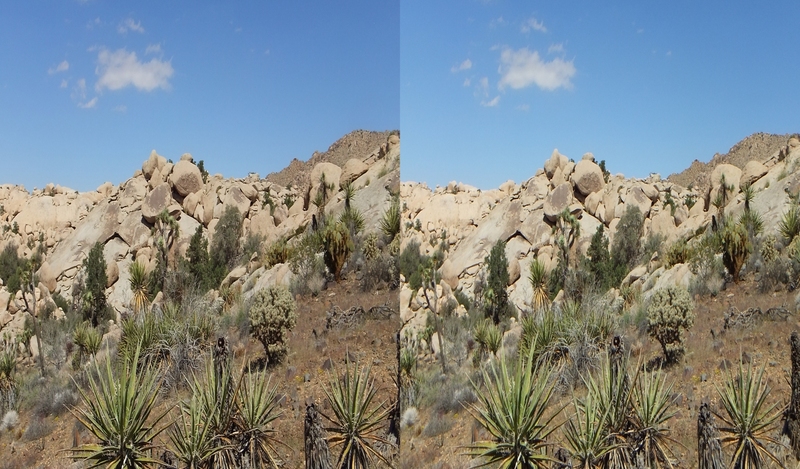 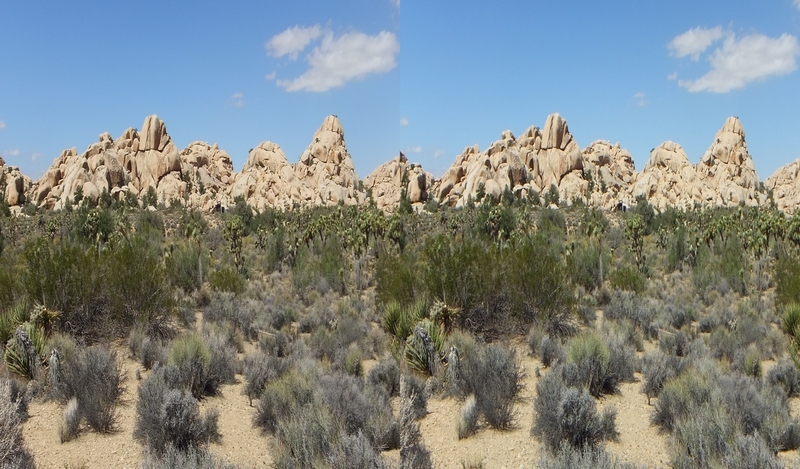 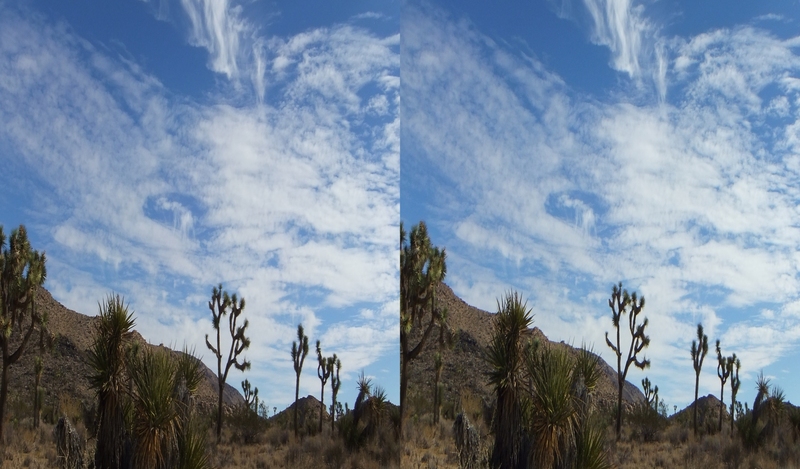 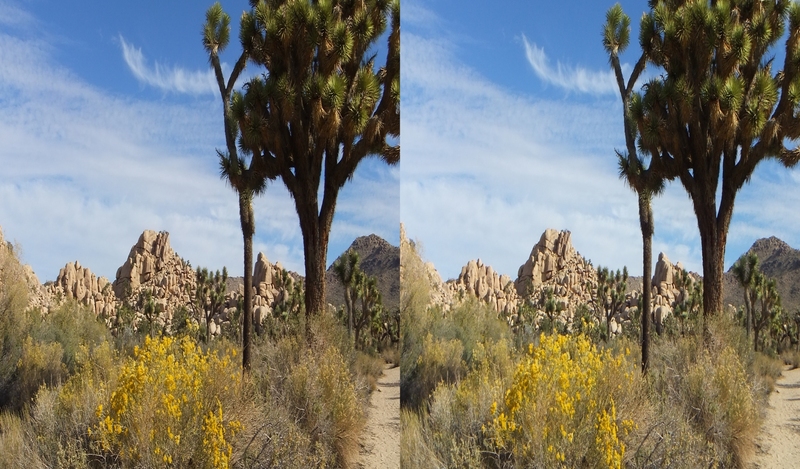 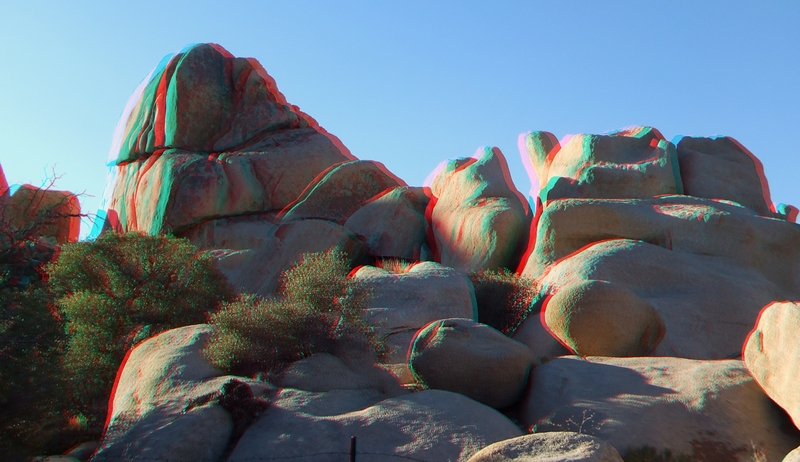 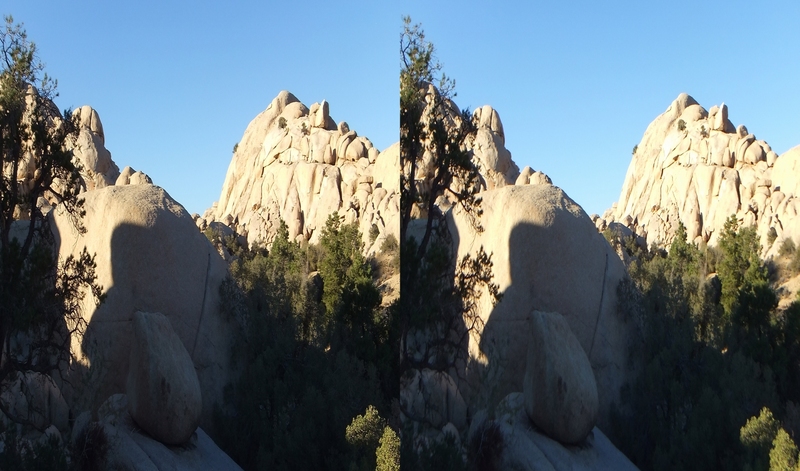 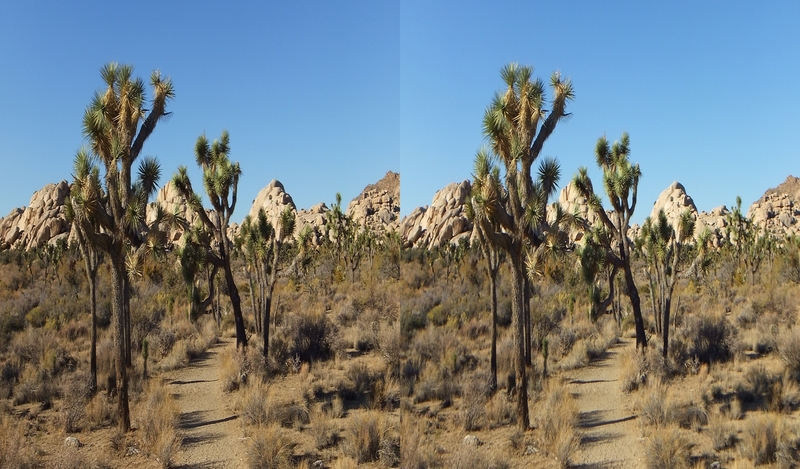 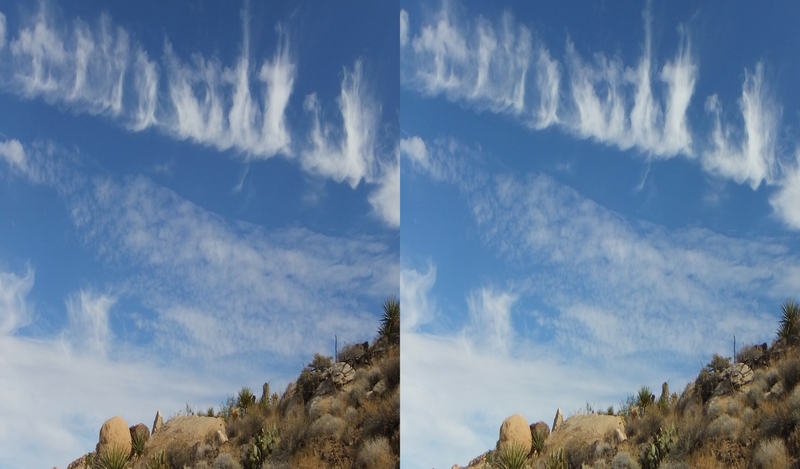 Thank you for visiting Joshuatree3D.